There are rules at chef Jake Bickelhaupt’s 16-month-old atelier: paid-in-advance ticketed seating; a one-bottle-per-person BYOB policy; and a Spotify channel that rings out from the open kitchen whether diners like it or not. But whimsy lives in the dishes he serves, like the demi-bouquet of lettuces that hide a cache of Spanish prawns on a brioche toastlette. In a summertime curtain-raiser, chef Ed Lee layers on a table-side homage to the ultimate Midwestern produce. 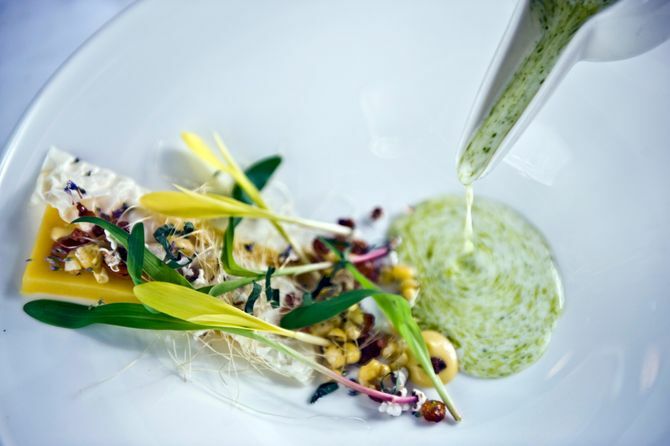 Fresh corn puree mixed with corn milk and a fresh housemade buttermilk, is speckled with green pumpkin seed oil. It’s poured table-side into a bowl bedecked with, among other things, a corn gel, dried corn silk, and popcorn shoots — a variety of sweet corn, harvested when it's just three inches. Traditionally, okonomiyaki is described as a savory Japanese pancake, so chef Wylie Dufresne and his chef de cuisine Ryan Henderson have taken that idea to its logical conclusion: unleashing this octopus dish that looks like a picture-perfect short stack of American hotcakes, topped with a pat of "butter" made with Japanese mayonnaise. Even the sauce — which Dufresne calls an okonomiyaki syrup — has the thick, perfect pour you'd expect to find in an Aunt Jemima commercial. 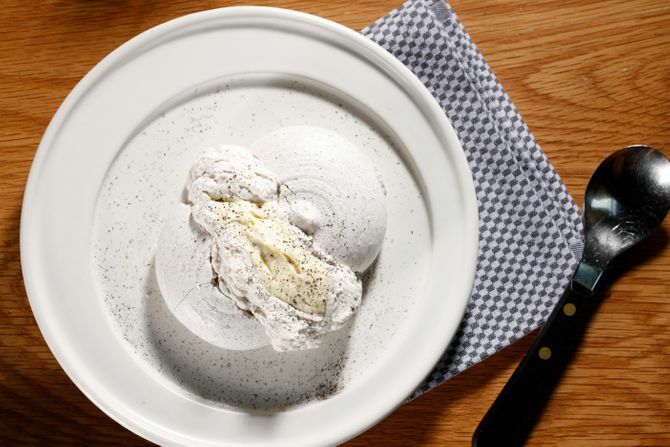 Black truffle meringue mimics concrete. Spring vegetables and herbs peek through the cracks like sprouts finding their way to the Midwest sun. 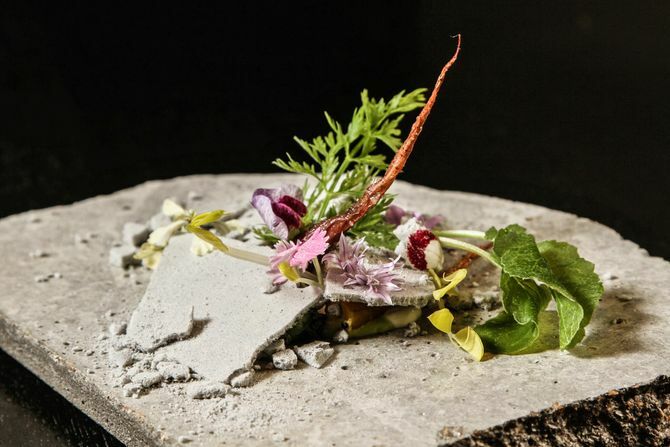 Table-side, servers "tag" the concrete with a carrot paint spray can, finishing the dish with a theatrical flourish not uncommon at chef Grant Achatz’s flagship modernist cuisine haven. Chef Ari Taymor, a 2015 nominee for the James Beard Foundation’s prestigious Rising Star award, recently added this dessert to his menu. Taymor sources the absolute best ingredients from Alma’s exclusive garden, and then presents them in a way that’s pure, simple, and elegant. The color scheme here is intended to represent a broken heart. Pastry chef Morgan Bordenave gets giddy about the obscure citrus fruits that come from her farmers. When more-orange-than-orange tangerines came around, she turned them into a semifreddo curd, sauced it with a bergamot simple syrup, and topped it with a slightly savory pistachio dukkah. 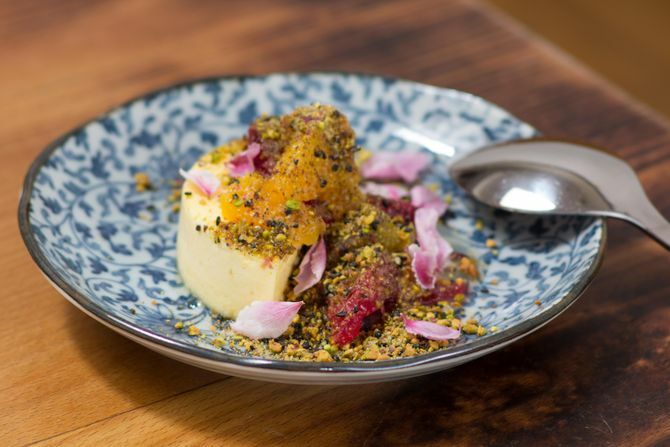 It’s a much-appreciated sparkle of tartness following the heft of a meal at Animal. 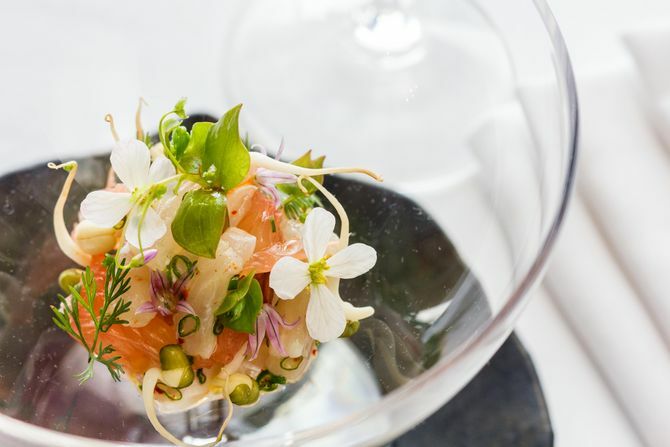 Chef Emma Bengtsson only took over Aquavit’s kitchen a year ago, but she’s already earned two Michelin stars. She got her start as a pastry chef, and this advanced dessert includes sea-buckthorn curd, a goat-cheese parfait, blueberry sorbet, honey tuile, dried brownie, and yogurt snow. Atelier Crenn is a grand homage to chef Dominique Crenn’s father, and this dessert recalls the Brittany coastline where she spent her childhood. 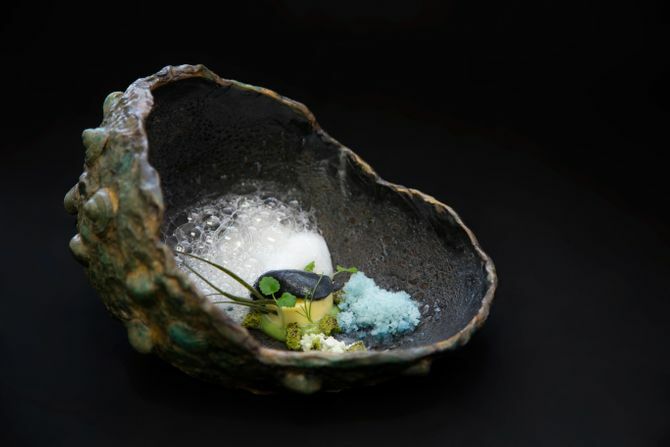 In a ceramic dish specially designed for this seaside memory sits a coconut ash sorbet, bubbles of sake, and blue-algae-tinged coconut-water shavings. Executive chef Joshua McFadden’s Roman-inspired dishes are a cross between the rustic and the refined. Using a classic Roman chicken liver pâte as a jumping-off point, he serves the livers seared and changes out the condiments seasonally. 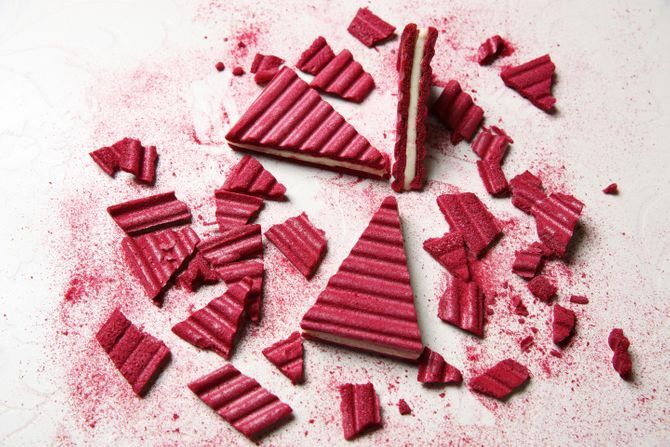 For now, they come with peppered rhubarb butter and vinegared rhubarb pieces. Many tourists in New Orleans will only encounter shrimp in the form of a po' boy, but at chef Justin Devillier's three-month-old cocktail destination, he gives the ingredient a true spotlight to shine: Sending them out not-so-simply accompanied by fresh uni, clam vinaigrette, and shredded fennel. 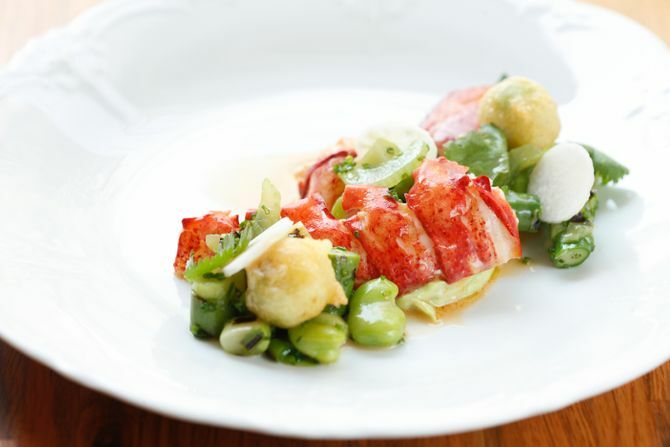 New York’s Adam Platt called chef Markus Glocker’s food “impeccably sourced, professionally plated, and generally delicious to eat.” This vibrant lobster salad, studded with avocado, fava beans, and jicama, certainly fits that description. 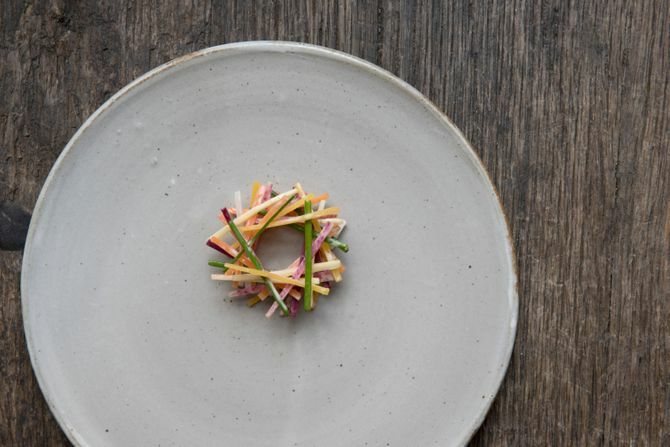 Always, chef Corey Lee’s kitchen sends out dishes that are contemplative and spare. But there is also intricate technique hidden with his guileless presentation. In this case, housemade rousong and tofu are the secret, high-caliber kitchen ingredients, but serene spring mornings are what come across on the plate. It takes about two minutes, a pair of tweezers, and a little bit of focus to assemble this pickup-sticks wreath of vegetables. Being from the south, coleslaw was a beloved staple of chef Bryce Shuman’s culinary upbringing. 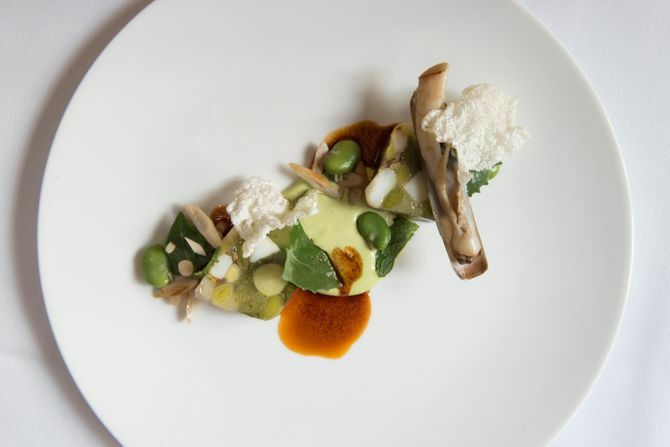 An alum of the kitchens of Eleven Madison Park, Shuman says he prefers dishes that say one thing clearly, as this dish does, rather than trying to tie together several elements on a plate. 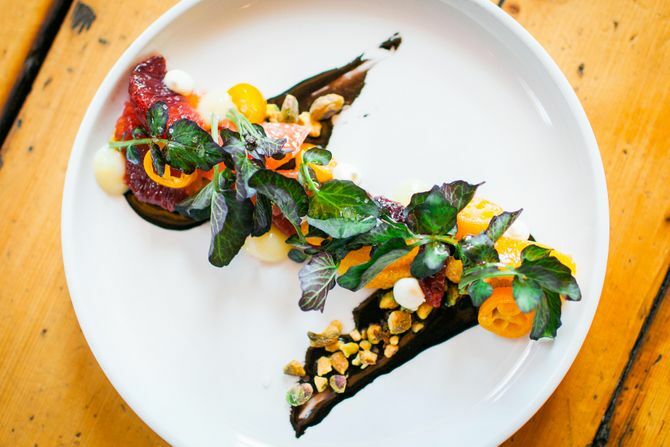 This fine-dining restaurant sits on a 9,200-acre farm, giving executive chef Cassidee Dabney the luxury of plucking produce right from her footsteps. She captures the wild feel of the vegetables here, while adding an unexpected dose of seafood roe for good measure. 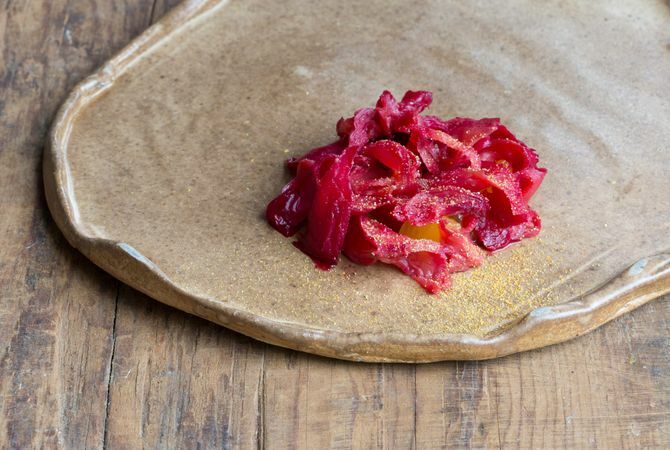 Dan Barber built his reputation on taking ingredients some people see as pedestrian, creating dishes that highlight their natural deliciousness, and causing many diners to rethink the way they see everyday plants. 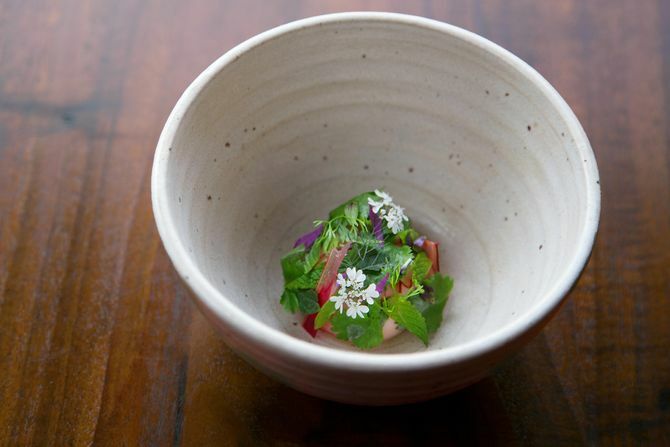 So the fact that you see "knotweed" — either the word, or the plant itself — and probably don't automatically think "dessert" is exactly what pastry chef Bobby Schaffer is counting on with this surprising, quite-possibly-attitude-changing creation that's served at Barber's iconic restaurant an hour or so north of New York City. Chef Travis Swikard starts this dish with fresh seppia from Spain, which is slowly braised in a mixture of chorizo, aromatics, wine, and its own ink. 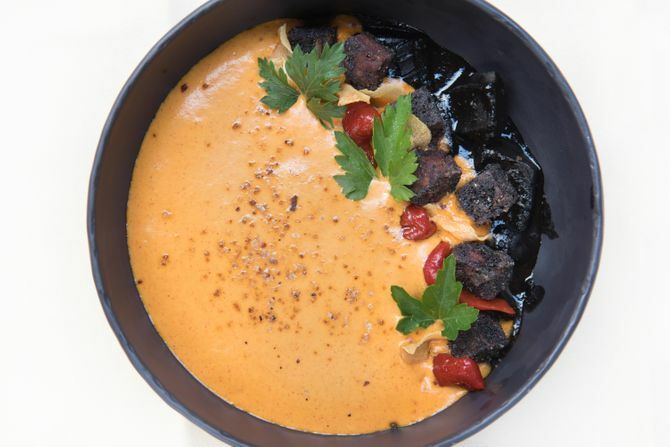 He manages to make it, and a garnish of diced morcilla, look truly unexpected with the addition of a creamy potato-and-paprika espuma that's spiked with sherry vinegar and smoked butter. Chef Aaron Bludorn had one goal when coming up with this dish: Highlight the sweet, seasonal crab meat while allowing the rest of the elements to "dance" around it. 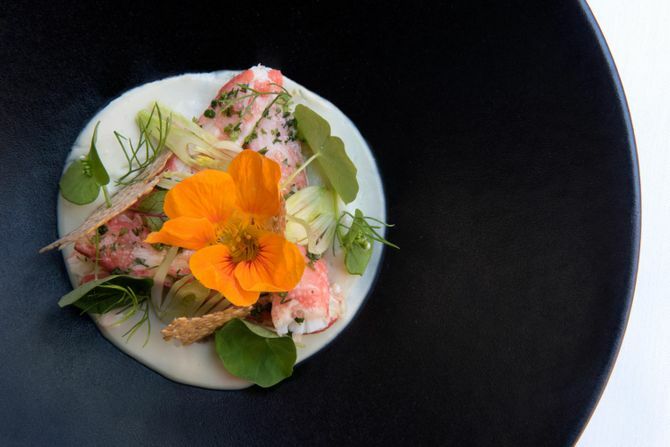 The resulting plate looks like a kind of techinicolor still-life, with the greens and warm-toned flowers also highlighting the striking color of the crab itself. Having recently hired chef Brady Williams from Roberta’s and Blanca in Brooklyn, the kitchen at Seattle's venerated Canlis is in the midst of a transition. 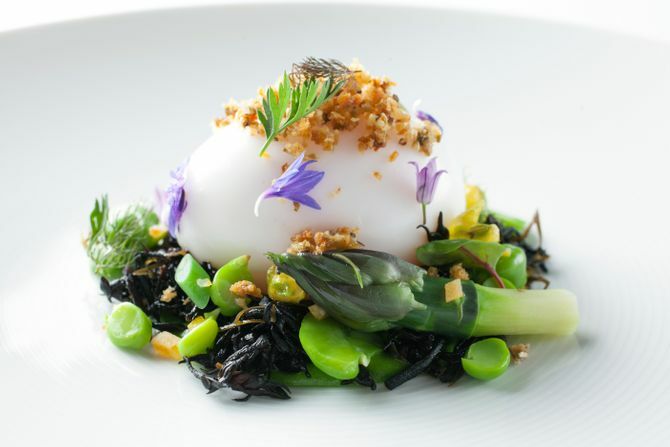 But in the meantime, executive sous chef Mario Hevia created this ravishing duck-egg showcase, balancing the richness of the egg (which reveals its runny, golden yolk when pierced with a fork) with a bevy of spring produce and briny seaweed. 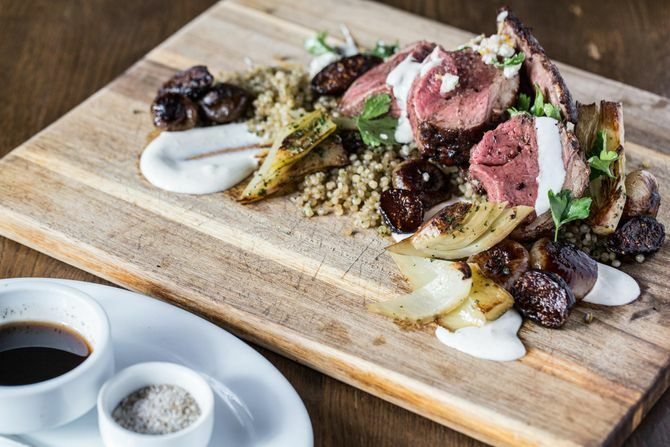 This critically acclaimed Nashville tasting counter offers a multi-course menu for $115. This beautifully dimiutive aromatic sponge-cake dessert, with fresh, fragrant herbs, and a pinch of salt, is completely representative of the care that the kitchen takes with all its dishes. On one menu, Central Provisions can range from bowls of saucy chicken wings to daintily composed gardens of vegetables. 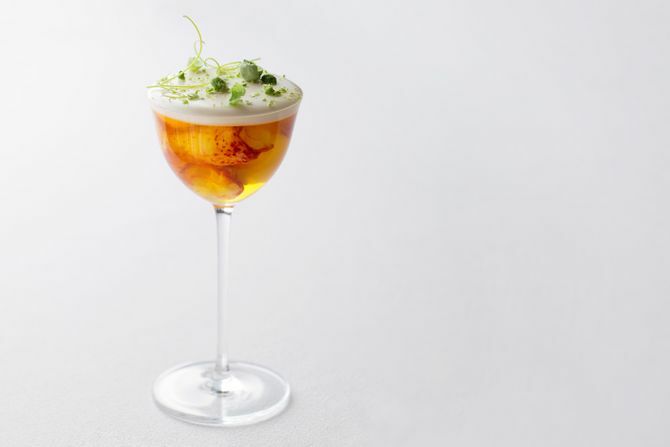 In this sweet and savory assemblage, chef Christopher Gould steeps jasmine tea in cream and gelatinizes it to stand up to segments of late winter citrus. 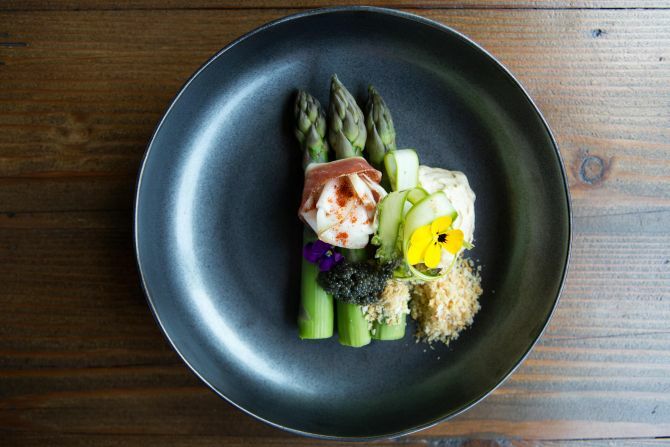 In Europe, of course, the season's first asparagus — and especially white asparagus — is heralded as the first sign of the warm months ahead. 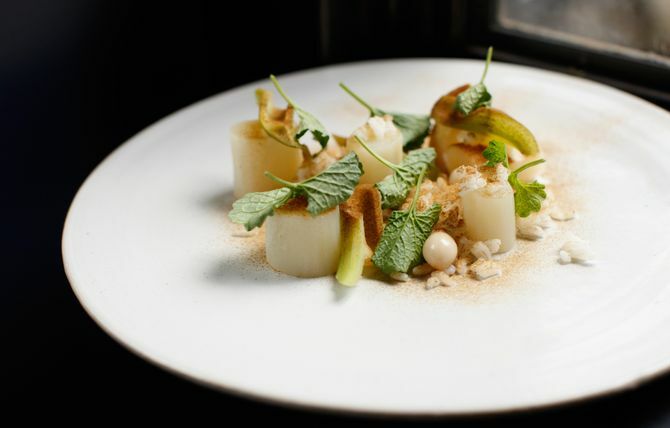 And in this brand-new upscale Manhattan dining room, chef Shea Gallante takes a similar approach, adorning stalks of French asparagus with spring onion, slivers of raw porcini, and seasonal green garlic. 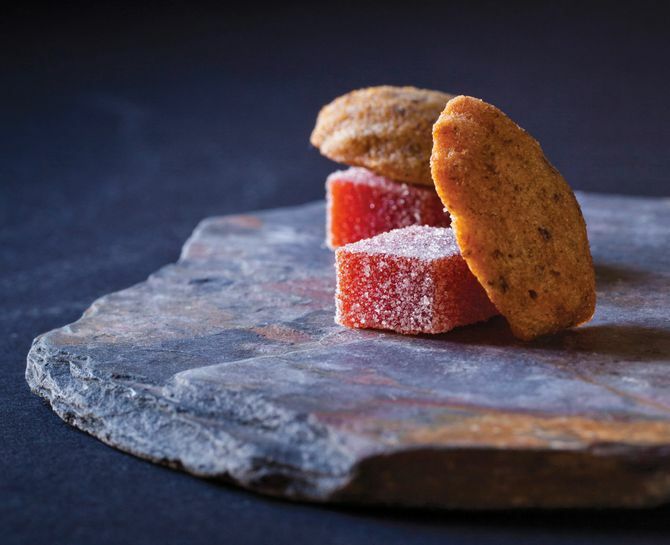 Everything that comes out of Daniel Patterson's kitchen is technically stunning, and pastry chef Nick Muncy's desserts are no exception. 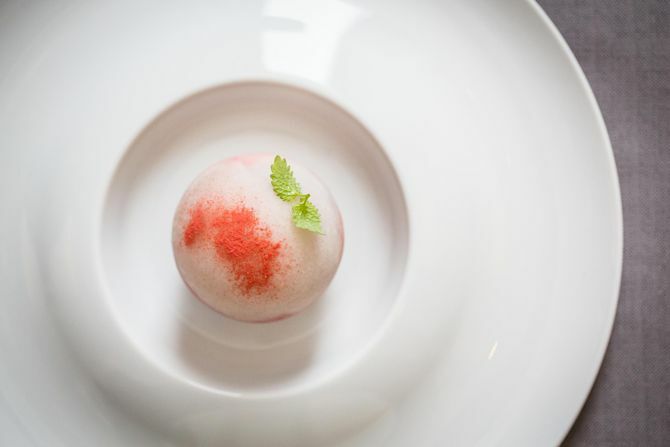 For this seasonal offering, Muncy makes a frozen "marshmallow" out of rhubarb puree, before adding raw rhubarb slices, rhubarb chips, and a small garden's worth of fresh herbs that include hyssop, mint, Thai basil, verbena, cilantro, and edible flowers. The interior of Commis is muted — all gray and tan and white — which only helps the eye train on the dark red of this dish. 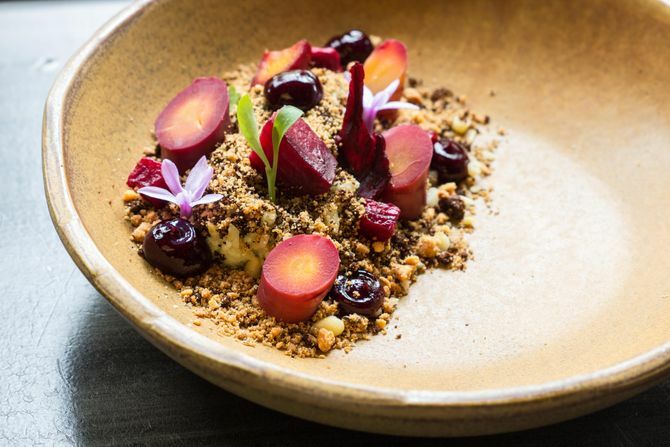 Chef James Syhabout made a name for himself as something of an outsider, and he gets a charge out of using ingredients like cherries at unexpected times. Here, they’re preserved, which Syhabout hopes serves as a reminder that cooking techniques developed from ancient necessity. Traci Des Jardins’s restaurant on the grounds of the 27-acre Presidio looks at Spanish cuisine through Northern California eyes. 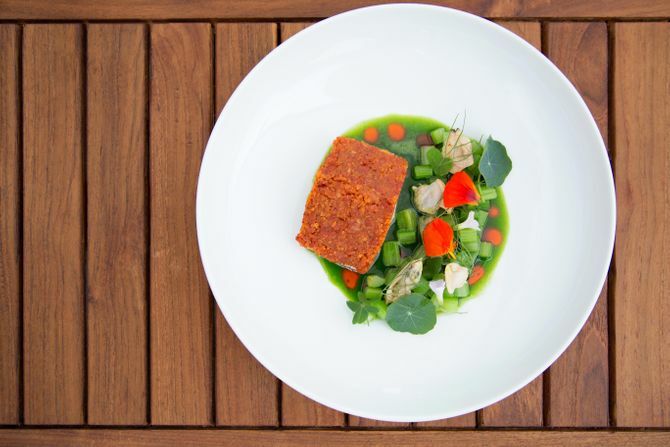 This dish marries those perspectives with her French training by using Fort Bragg Cod from nearby Mendicino, applying the out-of-favor persillade technique of grafting butter to meat skin, but substituting chorizo fat for the dairy. And, of course, several of her chefs live within the park and pick little lettuces and blossoms for garnishes on their way to work. 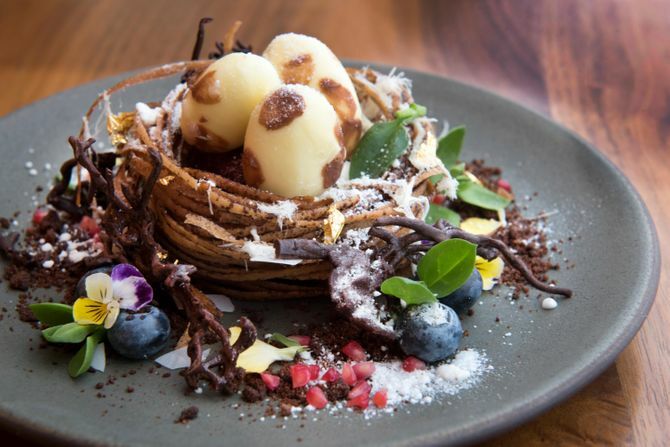 It’s probably the most Instagrammed dish of the year, and for good reason: Enrique Olvera’s dessert — made with corn-husk leaves that are burnt, blended, and whipped with egg whites and sugar — looks like a cloud, and tastes as light as you'd expect. The oysters at Daniel Boulud's French-leaning flagship are like the haute, French version of a raw bar platter: The Pacific oysters are presented chilled, "en gelée," and garnished with fennel mousseline as well as plump lobes of uni. Finger limes — also known as "caviar limes" — provide the tart edge. For many chefs, it's enough to leave uni alone, sending it out adorned with nothing more than lemon and perhaps some flaky salt. For chef Jon Cropf, it's just the beginning of this composed plate, an uni mousse ringed by a salad of South Carolina cucumbers, lump crab, and Meyer lemon. In honor of Jose Andres’s homeland, executive chef Eric Suniga presents chimeric versions of Spanish classics. Beet meringue is dehydrated for a day, spread with La Teral blue cheese, and slipped into a panini press to create a playful version of the classic Catalan snack. It’s not out of the ordinary for Phillip Foss to invite his guests into the kitchen, blurring the lines of fine dining and disrupting protocol. He’s madcap and practically possessed, but it’s hard to argue with his Michelin star or the delights of this springtime dish. 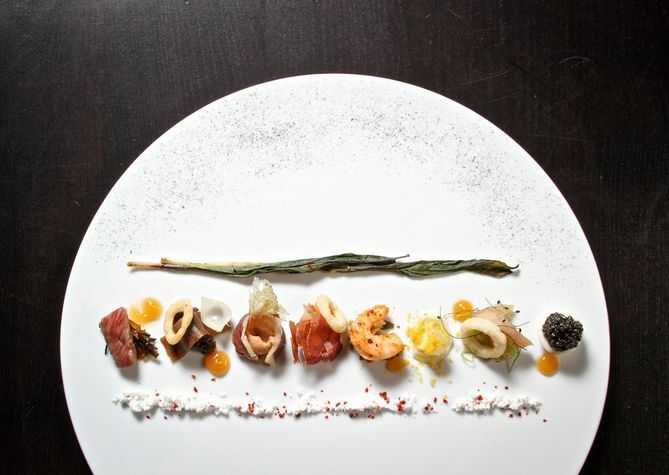 In a dead-of-winter premonition, he devised this showcase of the versatility of allium, preparing it in eight different ways and pairing it with eight different proteins. 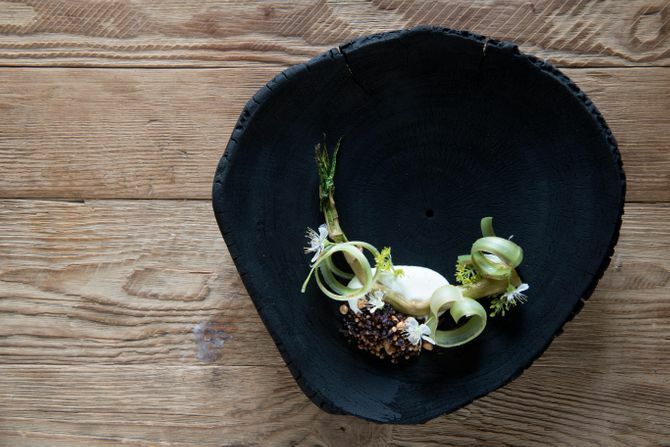 This past fall, chef Daniel Humm's kitchen blew diners away with a dish of celery root cooked in an inflated pig's bladder, which was presented whole at the table before being taken away and plated with celery root puree and black truffle. 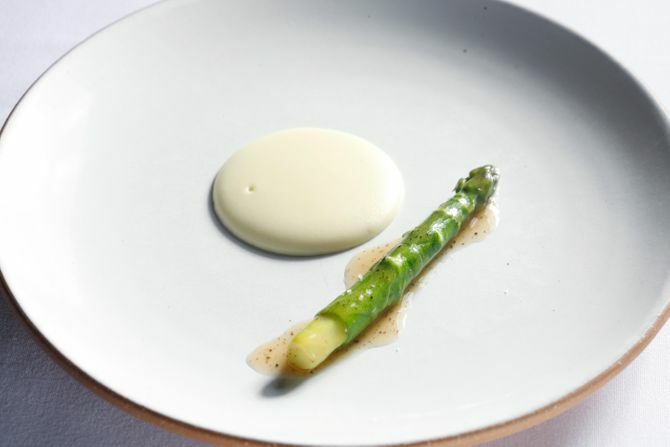 For spring, Humm has updated the showstopping dish with a few simple, but important tweaks: Asparagus takes the place of celery root, and the puree is now potatoes (hiding a black truffle puree underneath). 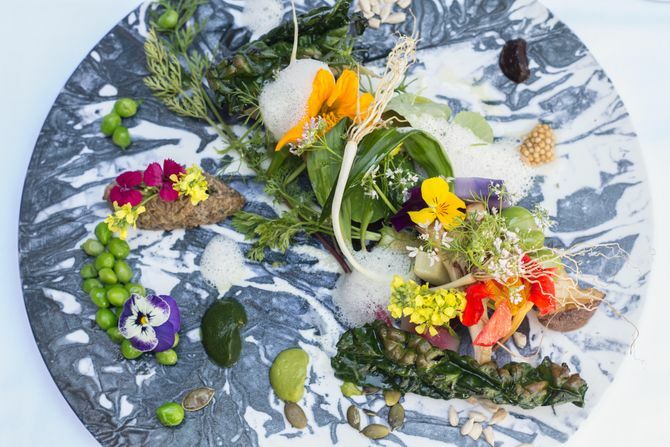 But the austerely meditative plating — purposefully at odds with the over-the-top cooking that creates into the dish — remains as stunning as ever. Chef Iliana Regan, one of the world's relatively few female Michelin-starred chefs, calls her cuisine New Gatherer, relying on what she can garden, pick, and, in this case, hunt. 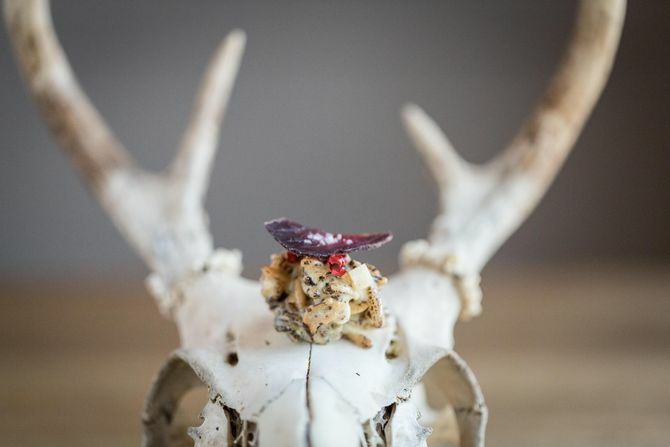 A slice of venison loin, hunted in the Indiana woods, is cured and dried, and presented on a found deer skull. Lest that be considered a tad too morbid, she offers it with a curried marshmallow rice-crisp treat tinged with aged Wisconsin cheddar. 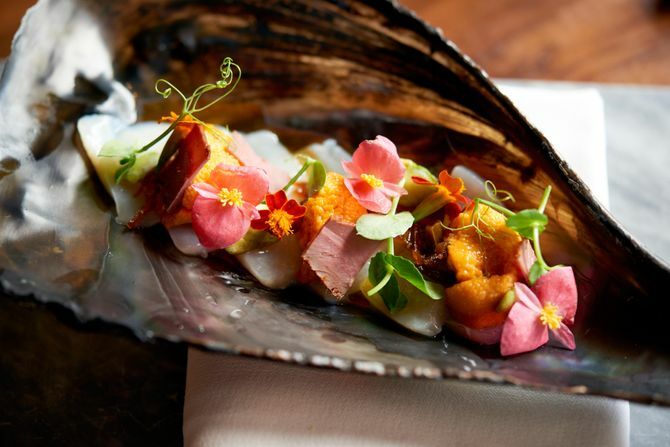 Alex Stupak made his name as the pastry chef at Chicago's Alinea and Manhattan's wd~50, and his knack for gorgeous presentations and techincal precision has carried through at his own trio of Mexican restaurants. 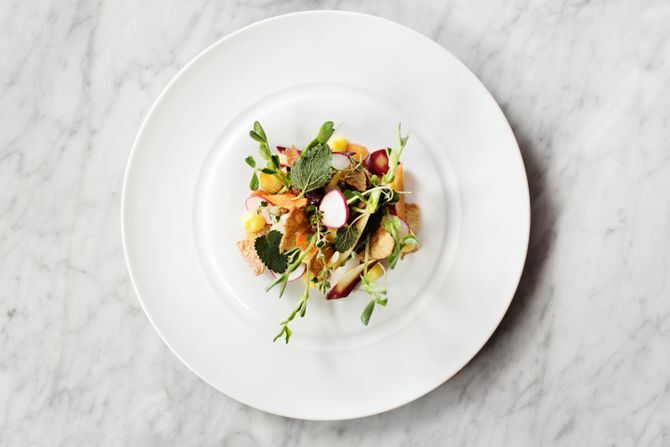 This dish is, as he puts it, a nod to vendors in Mexico selling fresh-sliced mangoes, given a gorgeous reimagining that is tailor-made for Instagram. 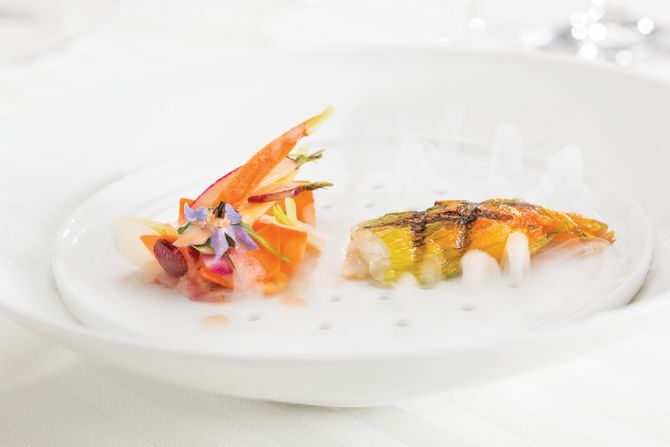 Chef Ignacio Mattos's distinct style is evident in the way his dishes appear perfectly composed without ever looking like they've been fussed over — as if the arrangements simply happened. 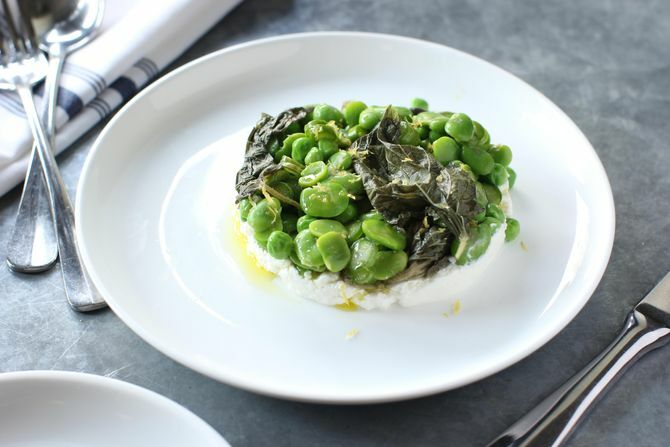 That's the case with this new dish, which pairs vibrant spring vegetables and soft, creamy ricotta into a loose ring that looks simple and spartan, a plating style every chef will tell you is the most difficult to pull off, since every detail has to be just right for it to work. In the dozen years that it's been open, Mike Lata's upscale bistro has become a staple restaurant of Charleston. 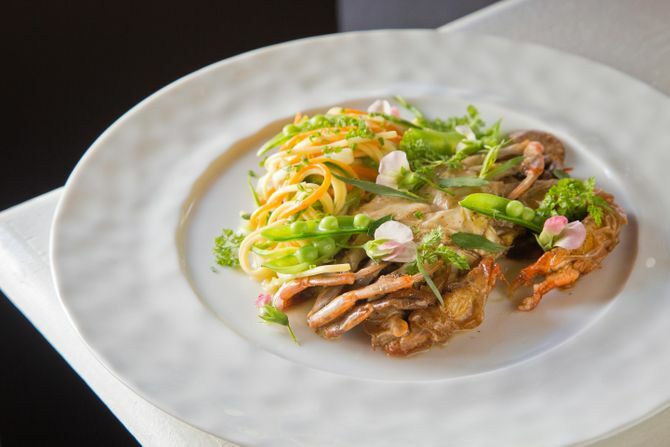 And even after all that time, the restaurant hasn't lost its ability to surprise, as it does with this gorgeous presentation of soft-shell crab, accentuated with spring produce and shavings of bottarga. Chef Eli Kulp could soon become a household name for his work at High Street on Market (which will open in New York this September), but it’s at Fork where he does his most serious cooking. Kulp considers this delicate, savory dish his signature, though it's only available for a few springtime months each year. Chef de cuisine David Breeden harbored a deep desire to serve a delicate chilled lobster stew. And now he's entertained that desire in grand style, using spring peas to speak to the season and a soft horseradish cream to enrich the dish. 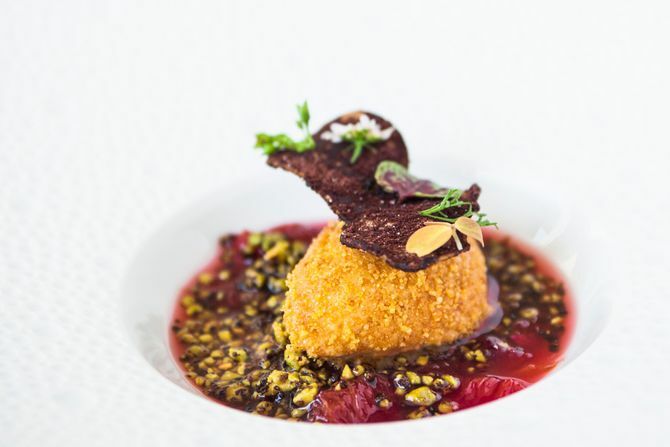 It is a perfect example of the way the French Laundry wrings elegance from simplicity. Earning two, and then three Michelin stars within two years of opening his West Loop restaurant, chef Curtis Duffy has seen his reputation skyrocket. His platings are playfully rarified but always retain something recognizable. That is true of this dish — a liquid nitrogen frozen orb of kaffir lime tea that, when cracked, reveals a carbonated strawberry puree. Dishes come out of chef Kevin Gillespie’s open kitchen dim sum style, offered by one of the eight chefs who invented and created it. Each chef is encouraged to have their own voice so diners are as likely to be approached with a tray of cheeseburgers as they are a Thai laab salad or bites of foie gras. With Gunshow’s typical lightning-in-a-bottle seasonality, this dish overlaps outgoing black truffle with new spring asparagus stalks juiced into a sleek soup. Fair warning: This dish will cost you $80 à la carte, but executive chef Mathieu Chartron’s langostine tartar might be worth it. Served with varying accompaniments (sometimes heirloom carrot petals, or a poached quail egg) it is always served on a perforated plate. 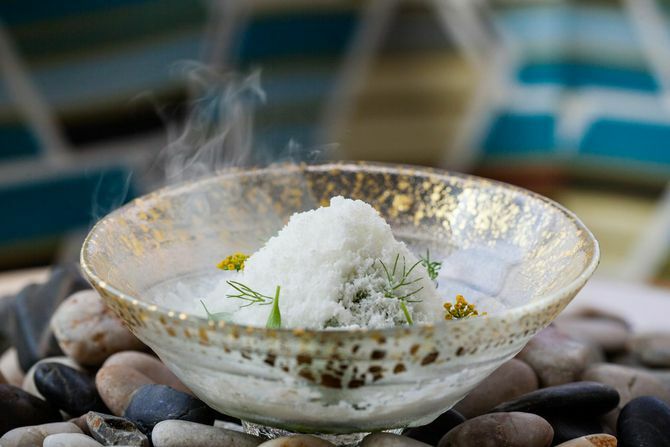 There's dry ice hidden underneath, on to which seaweed-infused water is poured table-side. The result is a foggy platescape and the wafting scent of the ocean. At this casual, celebrated Minneapolis restaurant, chef Jim Christiansen transforms squab — a.k.a. young pigeon — into a remarkably vivid composition. 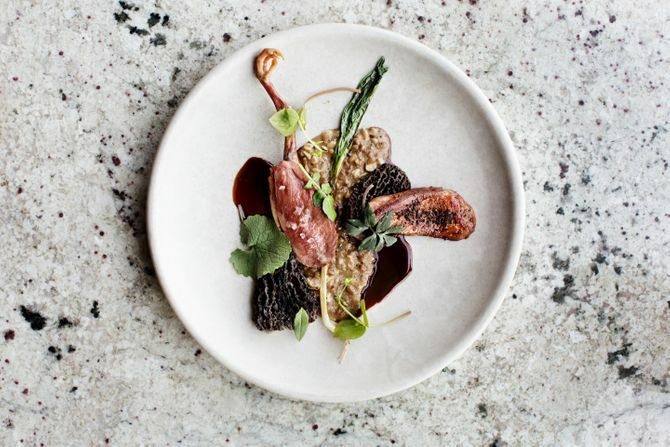 This time of year, that means he uses the dish as a showcase not only for the ruby bird, but also sought-after early spring ingredients like morels and first-of-the-season ramps. 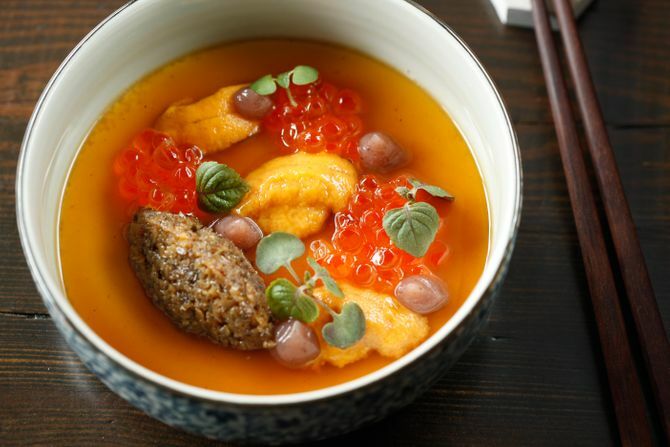 Hinoki & the Bird merges Asian influences with California cooking but don’t call it fusion. Their green curry and Thai basil lobster roll is a staple, and it's easy to see why. For it, brioche is dyed with edible charcoal powder — an optical illusion that suggests a hard crusty roll, though in reality it’s light and airy. If you needed a reminder that Sean Brock is one of the most talented chefs in the country, this dish should do it. 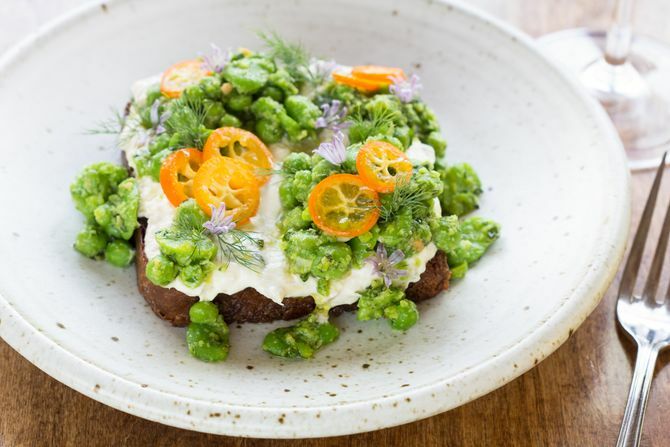 The food at Husk in Nashville is a bit more ornate than at its sister restaurant in Charleston, yet it all proves again and again that Southern cuisine has become one of the driving forces behind America's fine-dining restaurants. 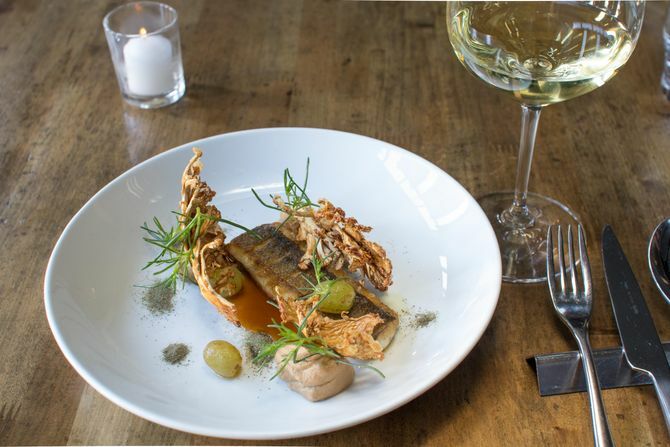 Chef Michael Voltaggio gets pegged as a modernist, but he is just as proud of his classic repertoire, so it is unsurprising that this ode to fish in Champagne sauce quickly became one of his most popular plates. 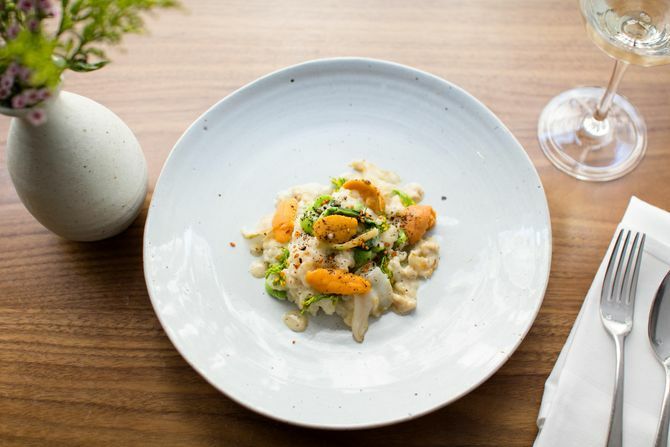 Cauliflower is showcased in a puree as well as deep-fried dehydrated branches, and instead of the bubbly, he adds grapes lightly fermented with yeast and butter. Though this dish looks simpler than what you'd find at New York City's other multi-starred temples of gastronomy, there is sophisticated beauty in the deep darkness of this charred squab. Inspired by chef Jean-Georges Vongerichten's eastern hemisphere travels, the dish makes a stop on the Arabian Peninsula with a za’atar-based rub before continuing on with a Japanese-style charcoal grilling. 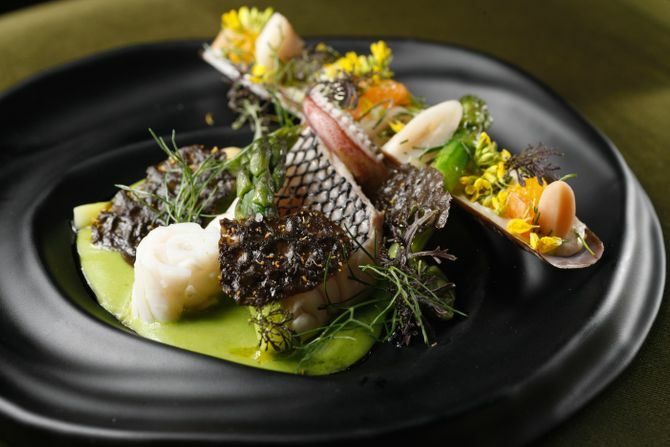 An amuse-bouche like this certainly sets the stage for the remaining 17 courses of chef Joël Robuchon’s impressively ostentatious Vegas outpost. 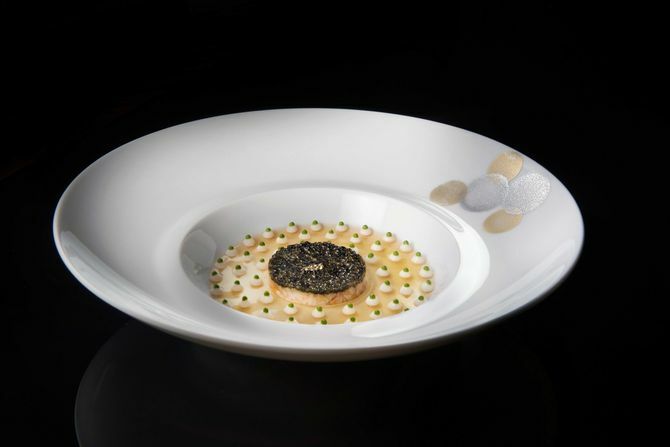 Comprised of Osetra caviar and king crab, then painstakingly decorated with a crustacean gelée, it embodies the old-school, hyperluxurious style on which Robuchon built his empire. Since chef Andrew Little opened Josephine on 12th Avenue South in 2013, it’s quickly become one of the city’s most respected restaurants. His cooking is ambitious, but the concept still feels warm and approachable. Case in point: Thick asparagus stalks are complemented by a heaping of ham and brown butter — Southern charm, expertly elevated to something more. Shaun Hergatt’s plates can be compared to fantasy landscapes, and this one is an overgrown fairy garden. A menu staple available since the restaurant’s opening over a year ago, the dish’s accompaniments are changed seasonally. 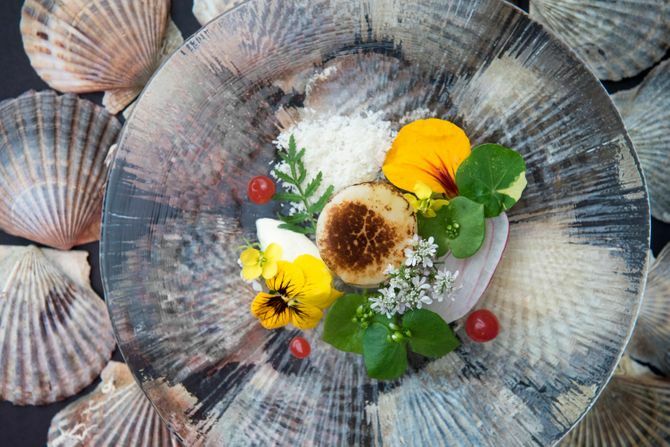 Currently, a Montauk scallop comes in live and is served bruleed, but still raw underneath, in a chilled orange and almond reduction among foraged miner’s lettuce, ferns, and nasturtium. The modern Mediterranean from chef Johnny Monis did big things for D.C.’s dining scene when he opened this tiny space near Dupont Circle 11 years ago. He quickly racked up a city-full of praise for his dozen-plus courses (including an interpretation on a gyro grill platter) served over four hours. After that onslaught, this slightly savory, cooling dessert is more than welcome. 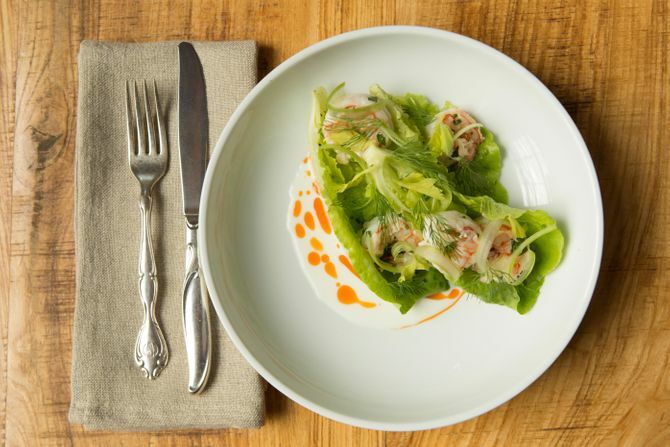 Lacroix, inside the Rittenhouse Hotel, is one of Philadelphia’s most sophisticated restaurants, yet the food is not the kind of stuffy, dated French fare you might expect given the restaurant's name and location. 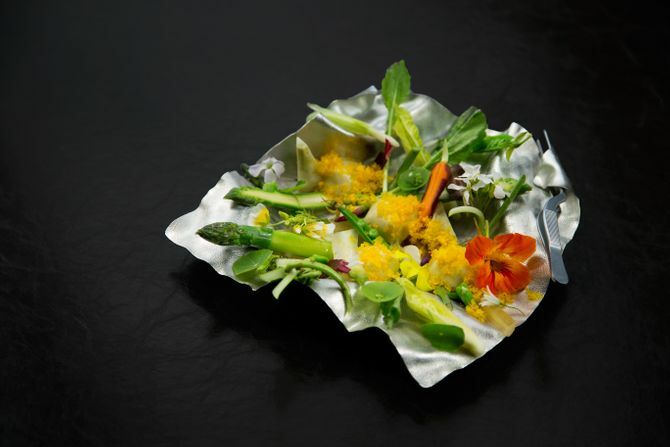 Take, for example, this melange of light, fresh seafood and seasonal spring vegetables. (As a bonus: You can try a four-course sampling of the menu for $79, and enjoy one of the loveliest views of the city. 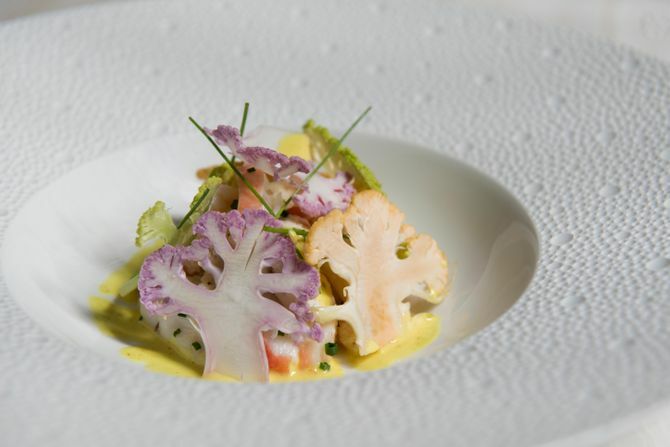 Plates at chef Eric Ripert’s venerable shrine to French seafood are more typically direct, sharp, and austere. 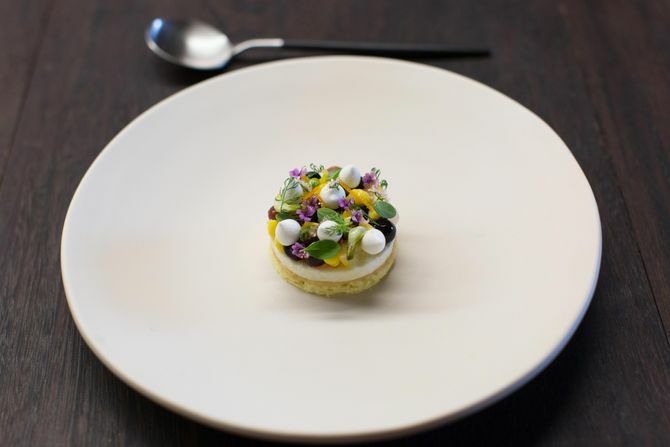 But in this one he takes advantage of the commencement of Maryland's mild-weathered crab season and decorates the dish with the pastel frivolity of an Easter egg, using wafers of baby heirloom cauliflower. 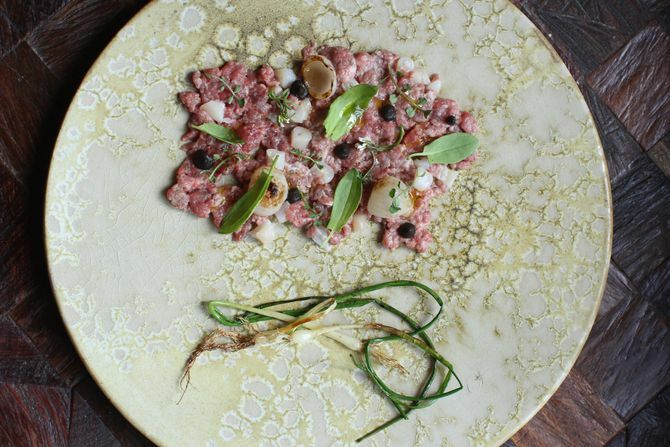 Luksus chef Daniel Burns previously served as the pastry chef at René Redzepi's Noma, and even though he's left the wilds of Denmark for Brooklyn's Greenpoint neighborhood, his dishes mantain an untamed, rough-hewn beauty, such as this surf-and-turf tartare, which puts as much emphasis on the greens as it does on the pristine beef and seafood. The most surprising thing about this presentation, from David Kinch's recently reopened California icon, is that it's actually two separate dishes that show up at two different points of the meal: Diners begin their evening with savory olive madeleines and red-pepper pâte de fruit, and end their meal with an identical looking sweet version, composed of chocolate madeleines and a strawberry pâte de fruit. The food at Michael White's Central Park South restaurant is famous for expertly melding comforting, rustic flavors with high-end technique. 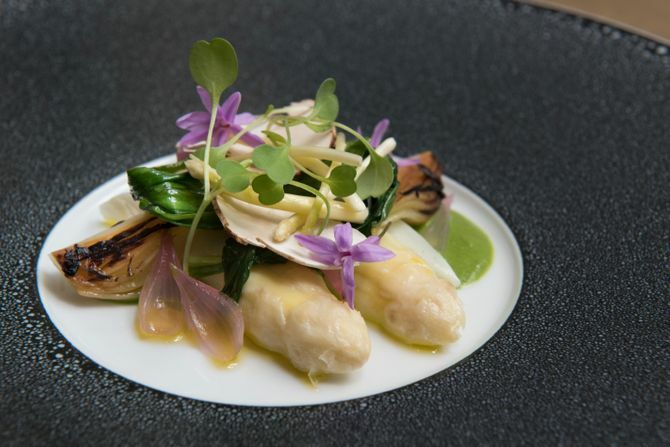 This seasonal terrine is a perfect example, combining salt cod with young spring onions, pickled ramps, and charred razor clam into a stunningly polished arrangement. At Måurice, even the savory dishes are precious, so it stands to reason that the desserts will look exquisite. 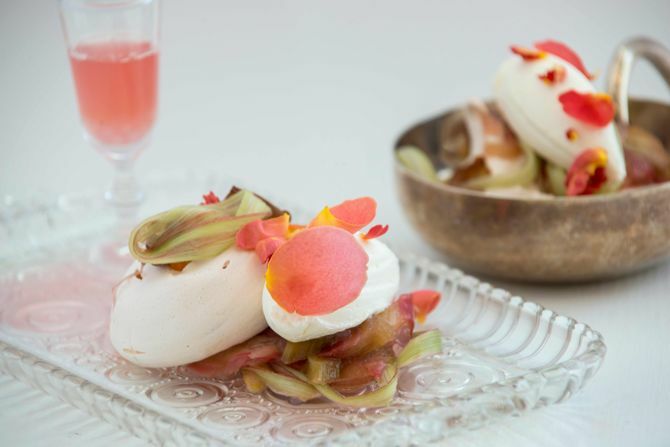 Chef Kristen Murray drew inspiration from her great aunt’s garden, where a tea rose bush was planted near rows of rhubarb. A purist, she uses master perfumier Mandy Aftel's rose oil and rose petals to layer flavor delicately in a dish that celebrates her French and Norwegian heritage. At this point, chef Sean Brock is probably best known for the incredibly satisfying burgers and plates of Nashville hot-chicken his kitchens can turn out at the two Husk restaurants. 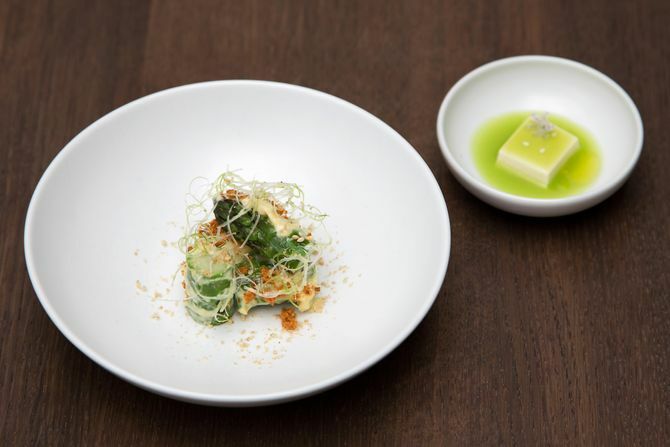 But at McCrady's, Brock and chef de cuisine Daniel Heinze focus on a menu full of refined, perfectly executed compositions like this gorgeously subtle study in green. 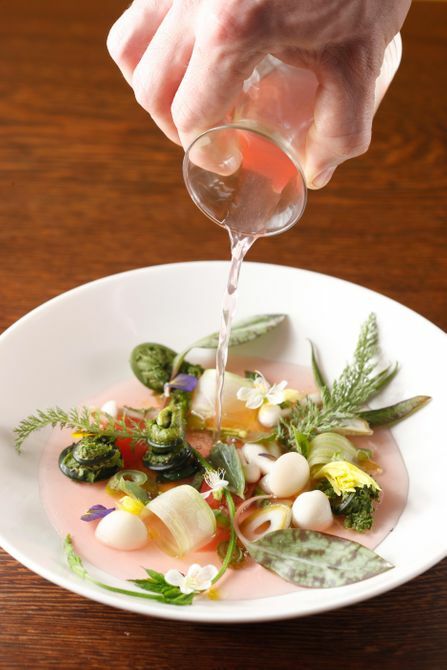 Chef Christopher Kostow settled down in the Napa Hills seven years ago, taking the reins at Meadowood and earning all of the top rankings for elegant but not-too-precious dishes. 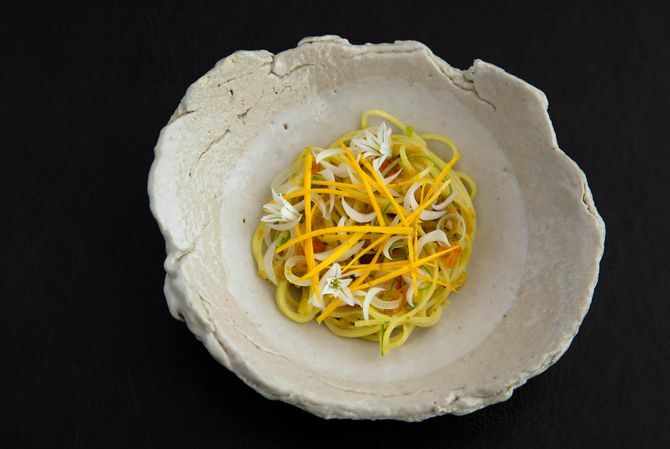 This one demonstrates his commitment to the keep-it-simple ethos — it is just high-gluten-flour cold noodles — as well as his fierce insistence on foraging and sustainability with flowers that come from his garden. 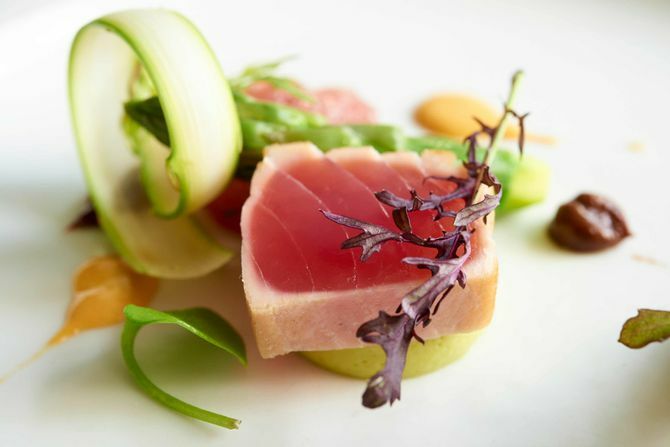 Reflecting a classic tuna nicoise, chef Scott Jones offers a familiar experience, in a novel context. The tuna, marinated in truffle juice and white soy, sits on barely set asparagus custard; the traditional hard-boiled egg is substituted out for the ocean tones of deviled sea urchin. Always cerebral and artistic, chef Ruben Garcia’s striking style can be traced along the lineage of modernist Spanish chefs. Here, he connects iced buttermilk to the puree of fresh herbs and added chlorophyll within to hint at the relationship between the cow and the grass it eats. Scott Anderson's elements restaurant (which reopens this summer) specializes in high-wire cooking, but the food at Mistral, his other spot, is no less complex. 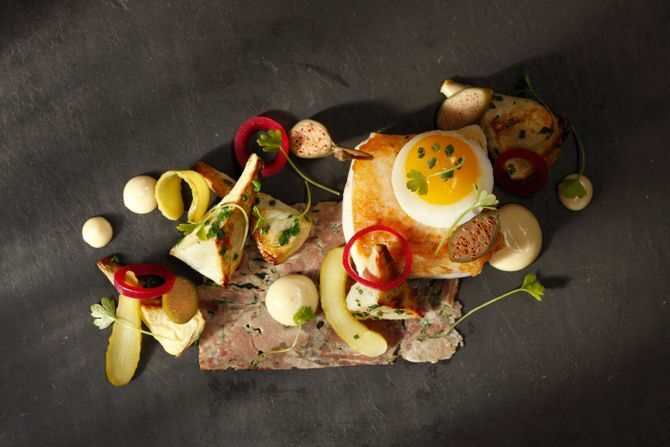 Take this presentation of roasted local fluke, which also includes tête de cochon, a wobbly fried quail egg, and a perfectly placed scatter of garnishes. Chef Sean Gray's food at the new Momofuku Ko exhibits a polished point of view that doesn't lose the playfulness and sense of experimentation that David Chang's restaurants are known for. 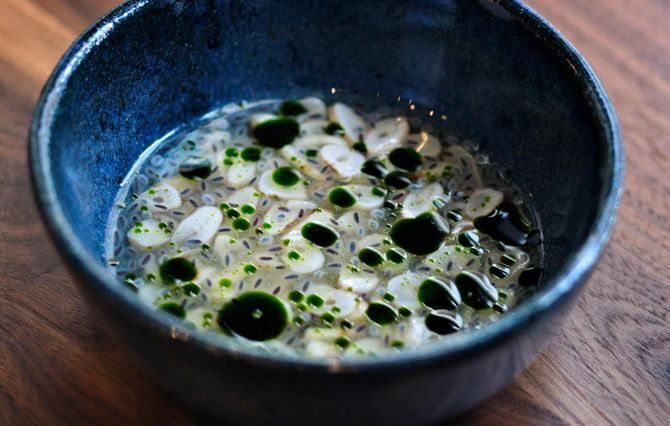 For this dish, which appears midway through Gray's umpteen-course tasting menu, the chef starts with a bowl of pineapple dashi, then studs it with bites of razor clam, basil seeds, and gorgeous spots of basil oil. When chefs Grant Achatz and Dave Beran ate with Albert Adrià at his Barcelona restaurant, Bodega 1900, they realized traditional patatas bravas was due for modernization. 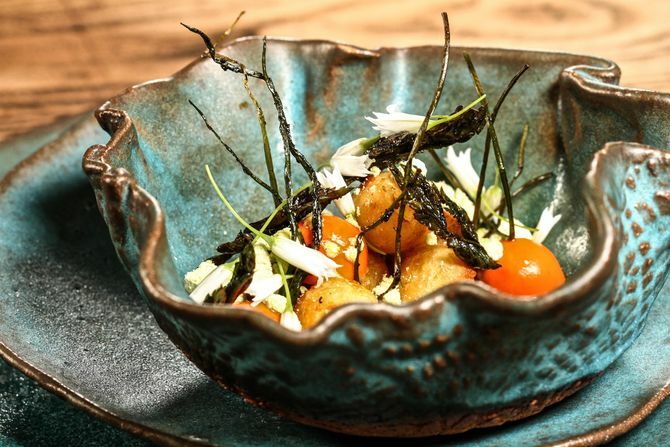 So for the upcoming rotation of the restaurant's thematic menu, focused on tapas, they cut potatoes into spheres, thickened the aïoli, and encapsulated the bravas sauce to make what looks like a bowl full of wild marbles. 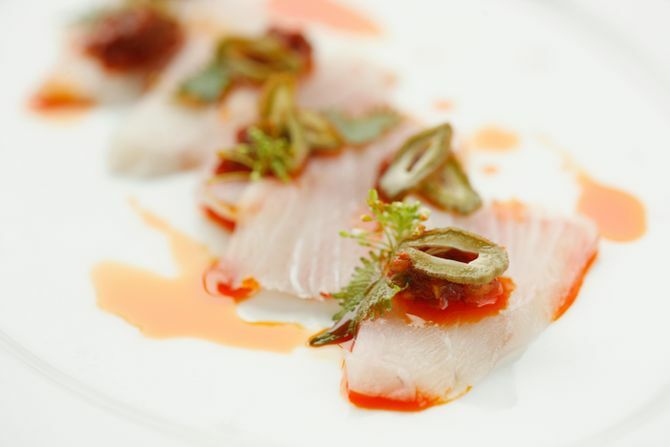 Italian seafood is the driver on chef Erling Wu-Bower’s breakfast, lunch, and dinner menu. 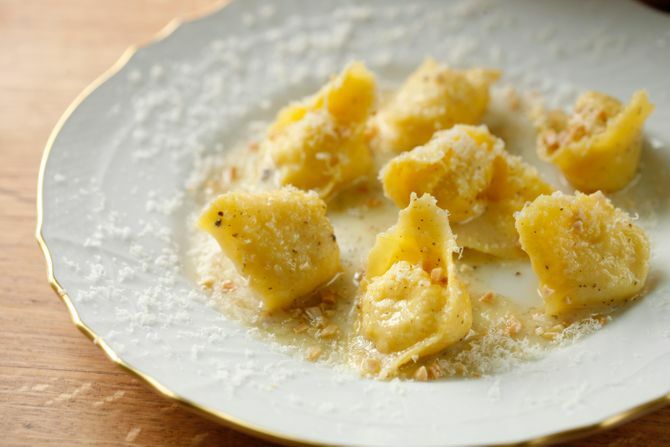 But many of his dishes have no regard for the regional borderlines — Milanese, Roman, and Tuscan influences might swirl around one plate. Here, stripes of egg and squid-ink noodles wave through lobster claws. 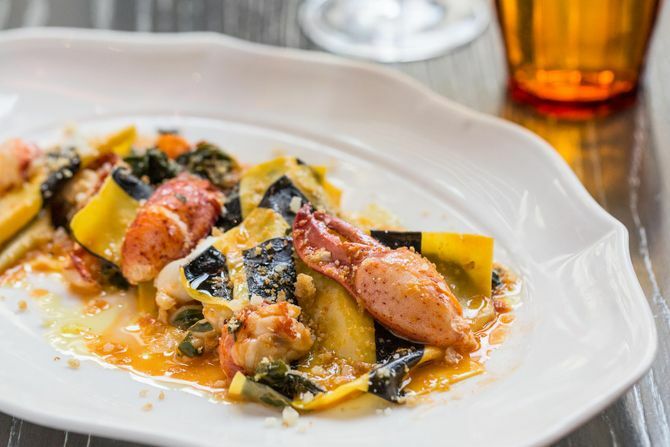 With potent lobster broth and Swiss chard, it exemplifies the subdued mash-up mentality to striking effect. Chef Chung Chow sets the tone early at his brand-new Hawaiian restaurant in the East Village: Diners expecting spam and roast pork can instead order this brilliant starter of soft tofu. Then again, given Chow's résumé, which includes a stop at Thomas Keller's Per Se, the refinement that's on display is hardly a surprise. Once in a while, chef Tim Cushman’s sushi dishes explode with color, but more often, they speak in hushed tones. 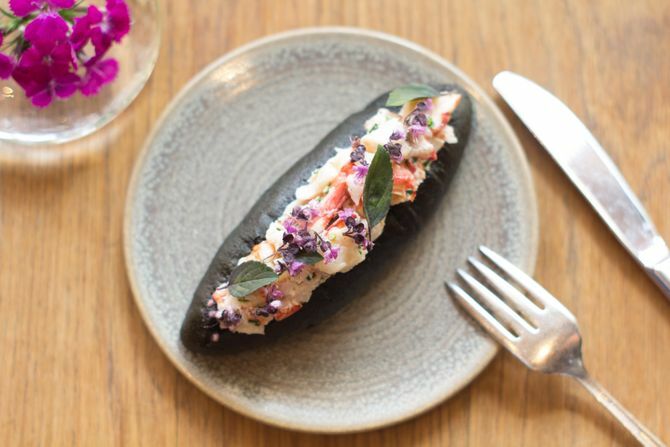 This one, a favorite since the restaurant’s 2007 opening, is capped with gray oyster liquor and squid-ink bubbles for an homage to the Northeastern seaboard. This short-grain risotto is exactly the way Josef Centeno intends to combine Italian and Japanese ingredients and techniques: robust, as Italian cooking is, but quieted with Japanese sensibilities. 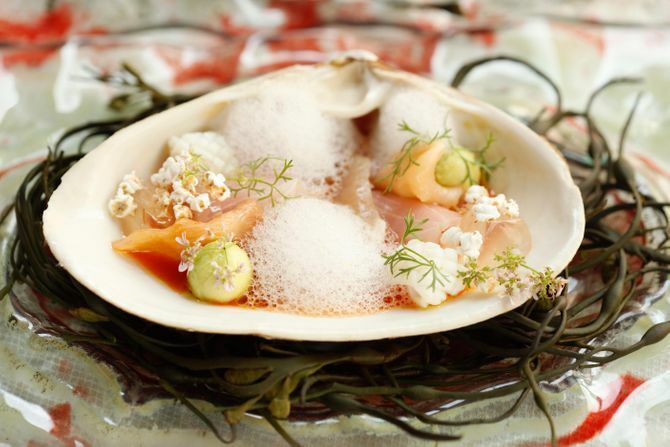 Earning a best-new-restaurant badge from GQ, among others, for his five- and eight-course tasting menus, Centeno is polishing the reputation of that defiled food term: fusion. 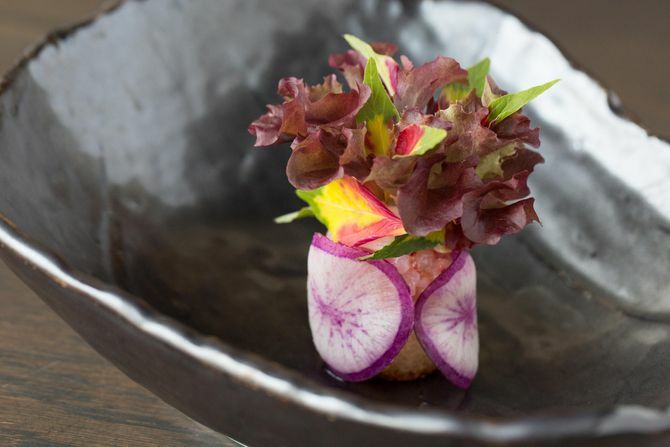 Chef Justin Yu instructs his chefs to think of a pile of rose petals when assembling this dish. 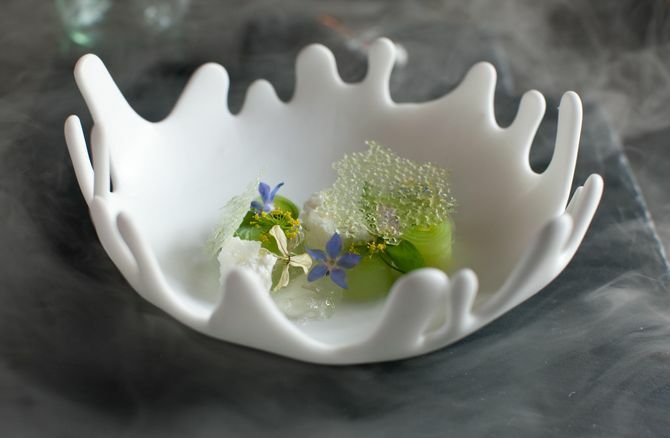 It speaks to his preference for keeping his plates monotone and playing with textures more than color. Beets are dried but then rehydrated with citrus juice, giving them tang and the bounciness of a gummy bear. This is how Thomas Keller's kitchens nod to the farm-to-table movement: with precision and perfection. 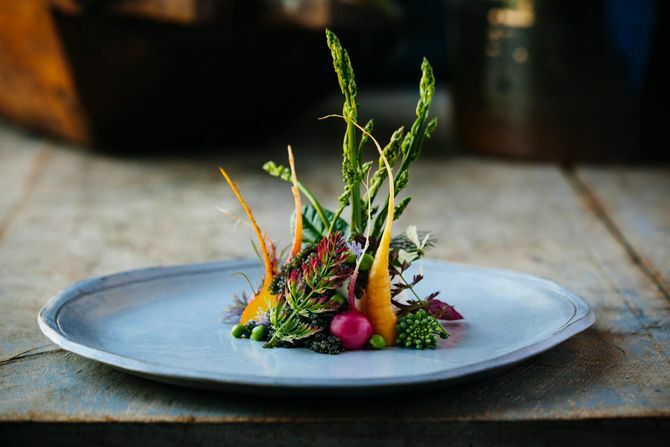 Keller's insistence in holding relationships with farmers, fishermen, foragers, and gardeners is staunch, so for this dish, milk-fed chicken and local farmers' market vegetables are the natural stars — beautified and put onto an appropriate pedestal. 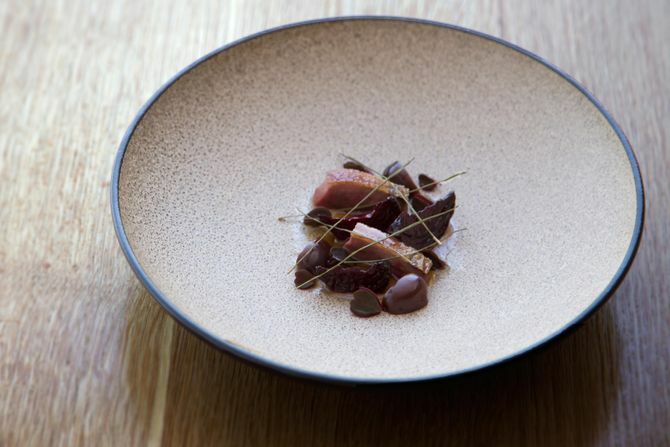 Hardly known for being reverential with his cooking, chef Jason Quinn proves he can also turn out delicate dishes, like a truly stunning bowl of fairytale eggplant baba ganoush covered in rye-flour chocolate crumble and dotted with plenty of other produce. 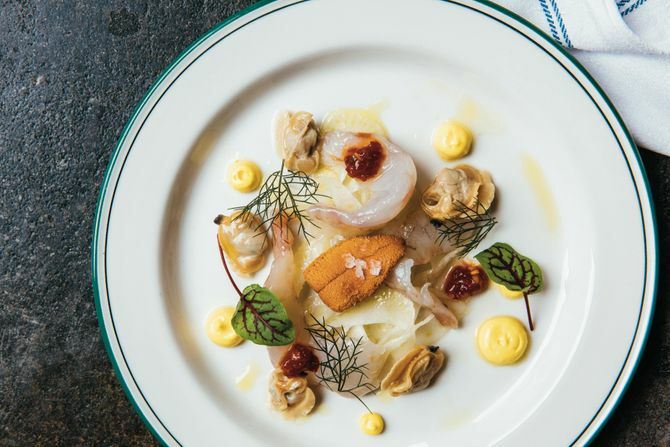 On his seafood-centric menu, chef Michael Cimarusti insists on utilizing every part of the fish including bones, skin, cheeks, and, in this case, fin meat. Prized for its richness of texture and flavor, it’s offset by the grapefruit’s tartness and a few drops of lemon juice. Chef Paul Qui’s dishes usually read as jaunty and irreverent, despite their intricacy. He goes for impact with delightfully offbeat combinations and colorful compositions. Which is why this dish is so surprising in its context: In a departure from that norm, these house-cured foie-gras-lined caviar tins are just flat-out luxurious. 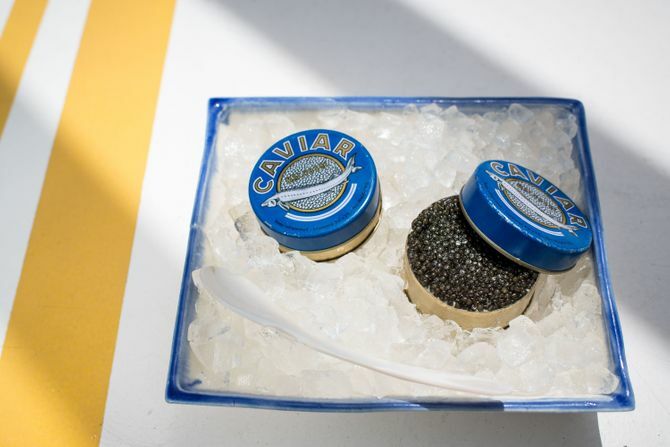 Yes, there's foie under all that caviar — and even some preserved Meyer lemon at the bottom of the tins to brighten the whole dish. The dish begins, as many do at the 11-year-old restaurant, close to home, in chef Michael Tusk’s rooftop garden. From there it heads first to Italy, incorporating a tuna spuma and salt-cured egg served in sculptable tin plates from Japan. 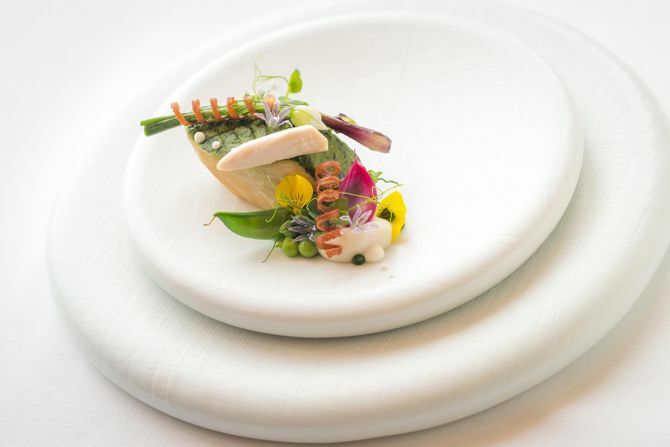 In a swoop of new-shoot-green, the essence of springtime is fixed onto a plate. 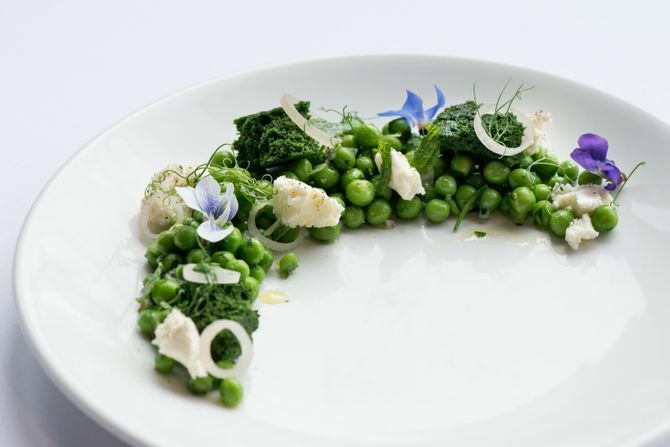 Peas coated with liquid whey are interspersed with parcels of mossy parsley-infused cake, violets, and arugula blossoms. The dish is a quintessential example of chef Linton Hopkins’s fervent insistence that simple Southern ingredients be presented royally. Chefs Trent Pierce and Patrick Schultz’s restaurant is a showcase for the finest seafood available, but they are hardly minimalists. 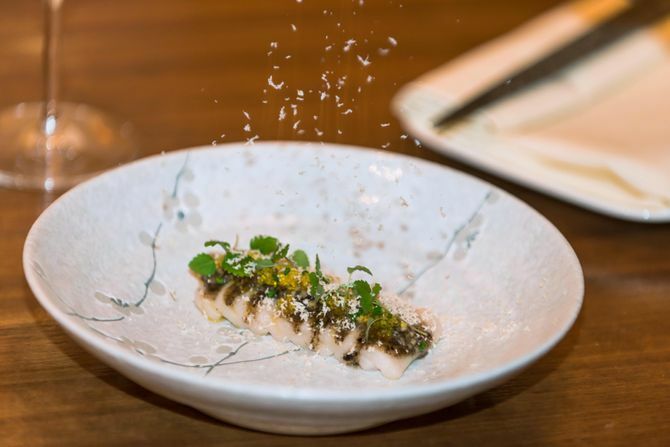 In this representation of decadence restrained, they send frozen foie gras out of the kitchen to be shaved table-side into a savory snowbank on strips of truffled walu. Rolf & Daughters is often cited for its expertly made pasta, but this shrimp dish is one of the most impressive items on the current menu. 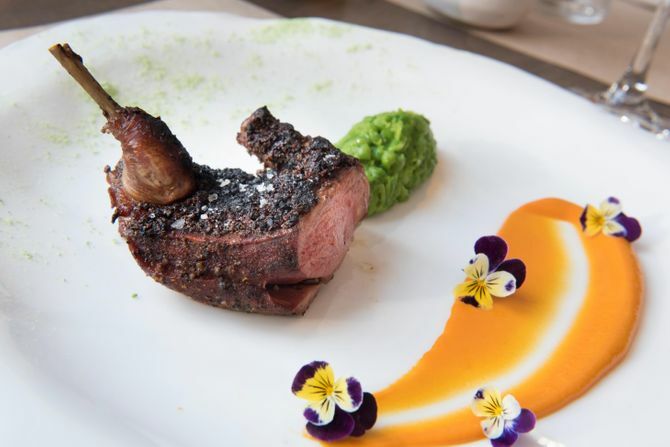 The colors are beautiful, and the plating style isn’t fussy at all — which is emblematic of the restaurant as a whole. 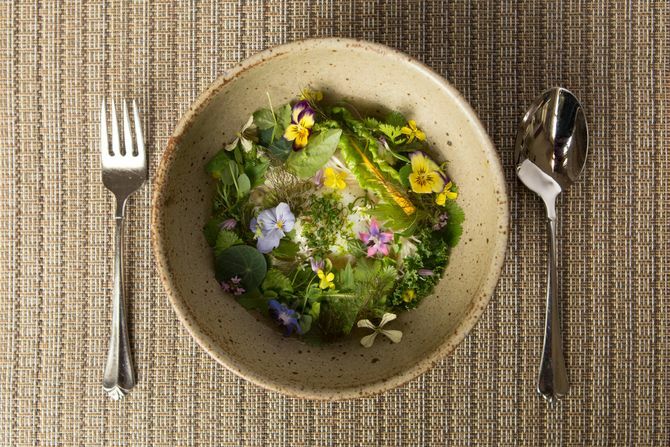 As many chefs do, Rustic Canyon's Jeremy Fox prides himself on adhering to sustainable practices as much as possible. So when there is extra cod or trout from Santa Barbara, it gets brined and smoked in-house, then plated on brioche that's made from scratch and griddled on the spot. Finally, this version is topped with favas, a green salsa, and bright slices of kumquat. This dish is proof that not every "beautiful" dish needs to be tweezer food: Instead, chef Edward Kim's platter of lamb is more like the ultimate farmers' feast, with beautifully thick slices of rosy protein taking center stage among an assemblage of perfect supporting ingredients. Like most of what chef Joshua Skenes serves, this dish begins in the Lagunitas fields of Saison’s farm. 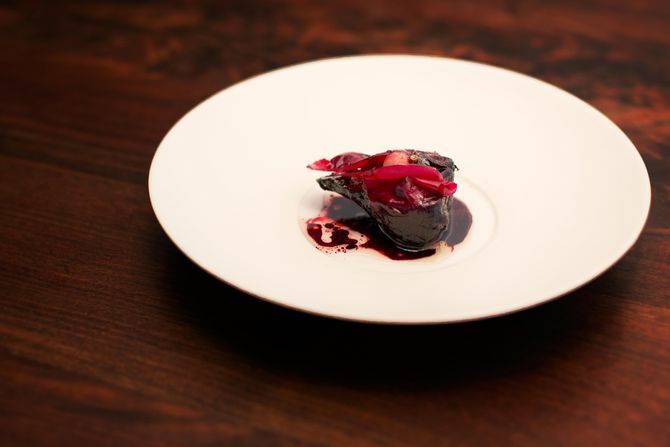 Beets plucked from the ground are dangled over a low fire for three days, then allowed to mature in beet juice for two days, then they're grilled slowly over and basted with bone marrow, for an hour before serving. Truly stunning. At chef Michael Carlson’s spare 26-seat laboratory of a restaurant, reservations are near-impossible and outbound communication is sparse. 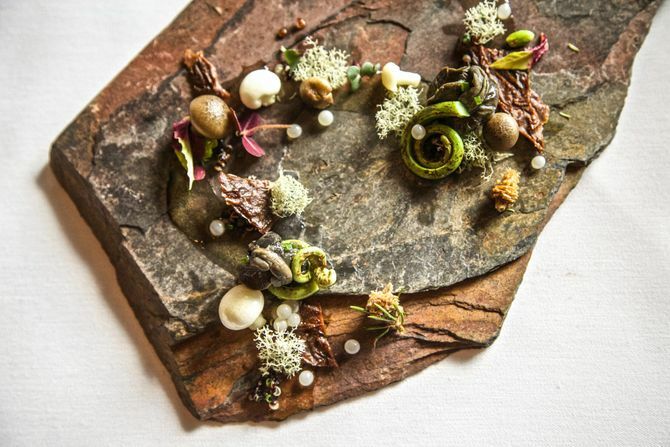 But once visitors find a way inside, Carlson demonstrates that he's a fiercely unique talent, as evidenced by darkly elegant, individualistic plates like this one, comprised of snails, moss, and mushrooms. 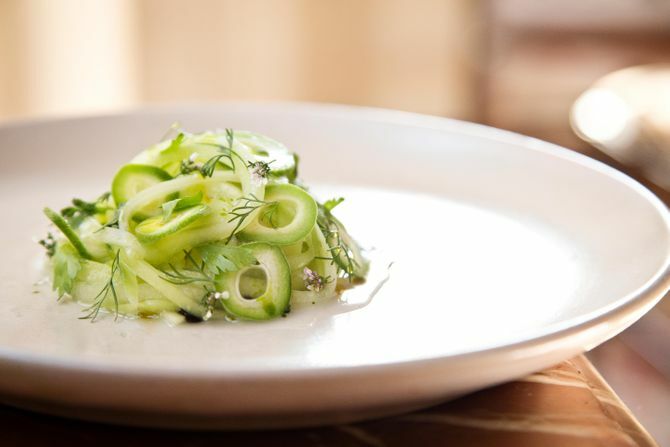 This intimate 18-seat Williamsburg restaurant isn’t vegetarian, but it is “vegetable-forward.” That means, of course, that it’s great to go in the springtime, when so much wonderful young produce is in season. And this brand-new dish makes the most of the big, fat asparagus available right now. 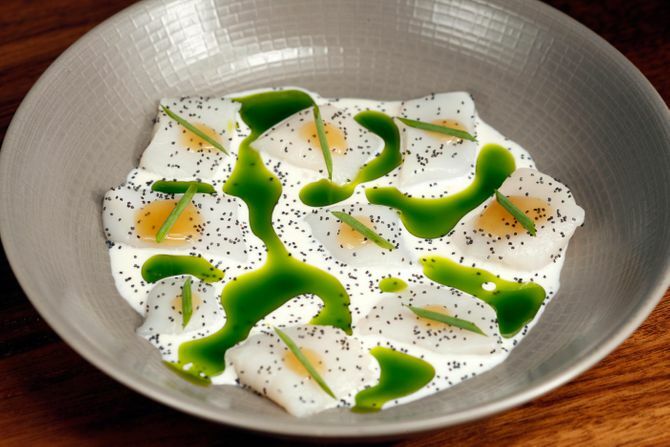 When Peter Serpico was the chef de cuisine at the first iteration of Momofuku Ko, one of his signature dishes was raw fluke gently bathed in buttermilk and poppy seeds. At his newer namesake restaurant in Philadelphia, he takes that basic template and lifts it to a new level of complexity — though in the process, he's made it no less appealing or approachable. 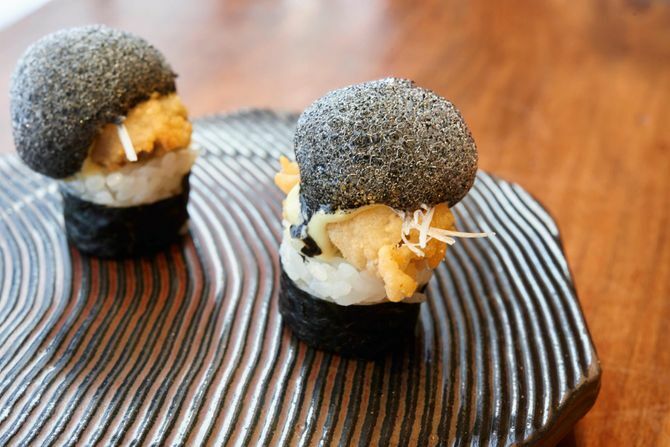 It makes sense that on custom-created dishes, bedazzled with toro, caviar, and uni, chefs Nick Kim and Jimmy Lau consider a humble grilled milk bread the centerpiece. It speaks to their respect for the handmade and, in this case, for the laborious two-day process of stove-blossoming and baking. In 2006, when chef Matt Dillon opened Sitka & Spruce, not every restaurant made use of foraged sorrel, and the vegetable-forward era was a long way off. But Dillon, decorated by a James Beard award and many other accolades, was an early adopter. 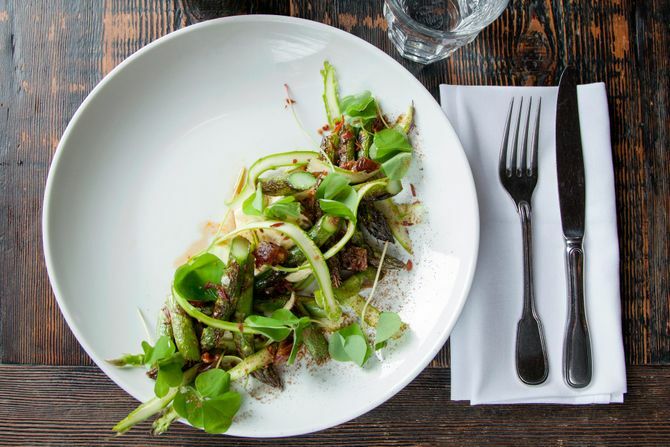 Built around farmers’ first asparagus and made hearty with speck as well as the last of winter’s sunchokes, this dish participates fully in the shift of seasons. 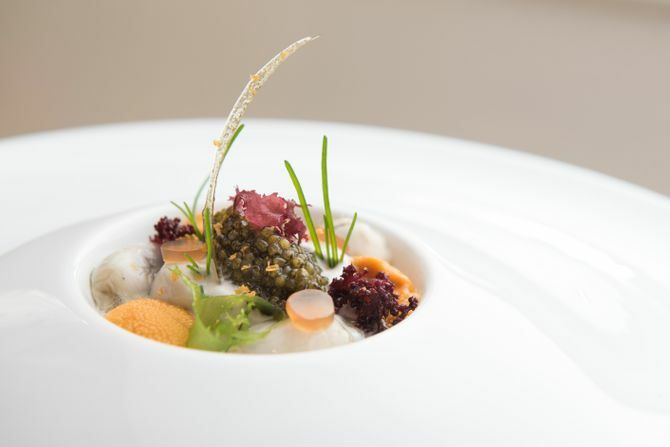 From the 16th floor of the Trump International Hotel and Tower, chef Thomas Lents generates multi-course meals that lay opulence on with a vigor, leaving diners exhausted. 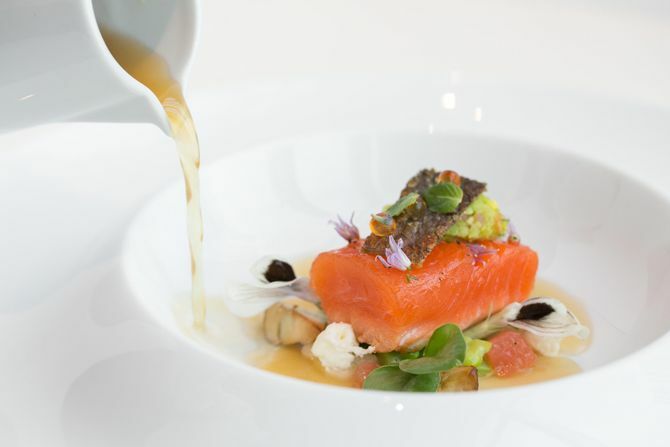 But this dish, part of a springtime look at the environmental and economic impact of mass production, pulls back with a more demure palette of wild king salmon, crushed favas, and their leaves. 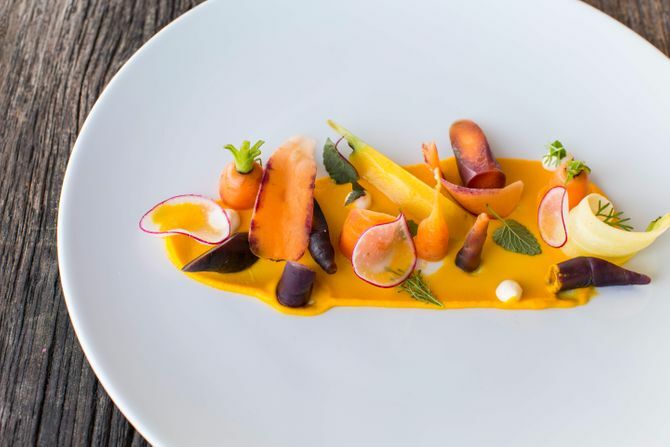 In honor of California’s local farmers' markets, each of the dozen-plus vegetable on this Kamachi plate is prepared separately and uniquely. It becomes so intricate that chef Tetsu Yahagi prints a menu card listing the details of each one. It’s part and parcel of what drives Spago — elaborate preparation that rarely reads as overwrought. Gavin Kaysen left Daniel Boulud's restaurant empire last year to open his own place in his Minnesota hometown, but this "salad" is proof that he has no intention of dispensing with the exacting nature he's become known for, not only as a celebrated chef in his own right, but as a mentor to America's prestigious Bocuse d'Or teams. Considering the demand for Jessica Koslow’s Silver Lake restaurant — there are consistent lines down the block — it’s impressive that she and her team take the time to make such beautiful, vibrant food in a casual setting. 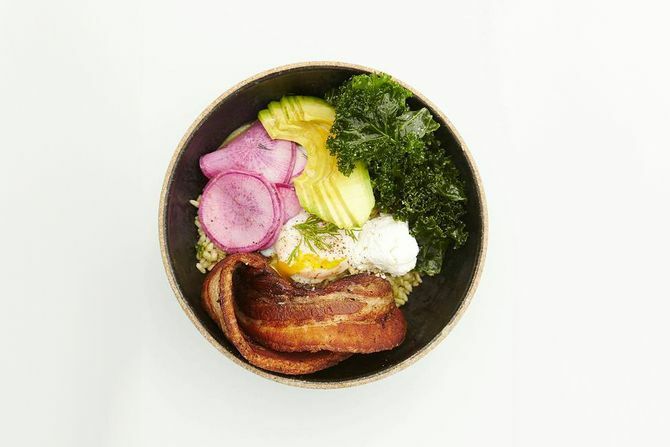 This dish is one of her most popular, and for good reason: It’s comprised of Kokuko Rose brown rice, sorrel pesto, preserved Meyer lemon, lacto-fermented hot sauce, radishes, French sheep’s-milk feta, and a poached egg. At $7.75, it could also be the most affordable item on this entire list. Chef Phillip Lopez serves this dish as a cleansing intermezzo at the halfway point of his 15-course experimental tasting menu. 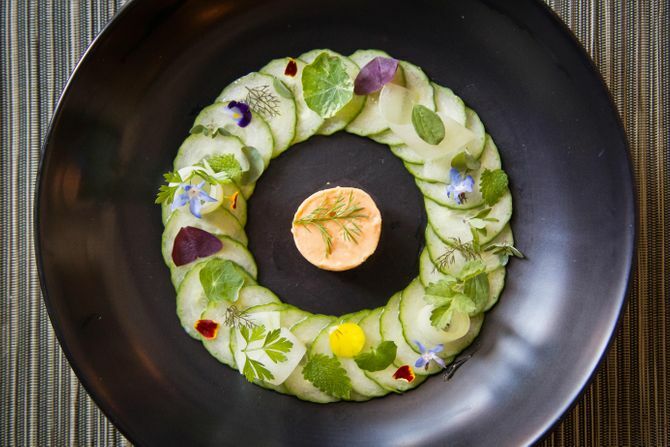 The plate is delivered at a subzero temperature with Frozen kaffir lime leaf mousse, tarragon “glass,” pickled cucumber, sorrel, and borage from the restaurant’s own farm. 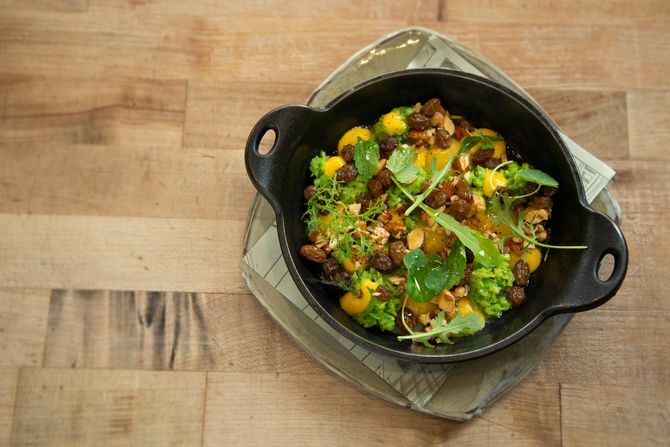 Half-Dozen Cast-Iron Quail Eggs With Fava Beans, Smoked Almonds, and Roasted Kumquats. Accolades for Nicole Krasinski and Stuart Brioza’s four-year-old, 82-seater are never-ending, and reservations are so scarce that their reservations system was once hacked by food-frustrated techies. This dish is not their most famous (that’s their fried quail), but it is a constant on their menu and incorporates simplicity and seasonality as well as the four taste elements they insist on for each bite: salt, fat, acid, and texture. This 12-seat restaurant, which is only open three days a week in Carroll Gardens, turned out to be one of the breakaway hits of 2015. 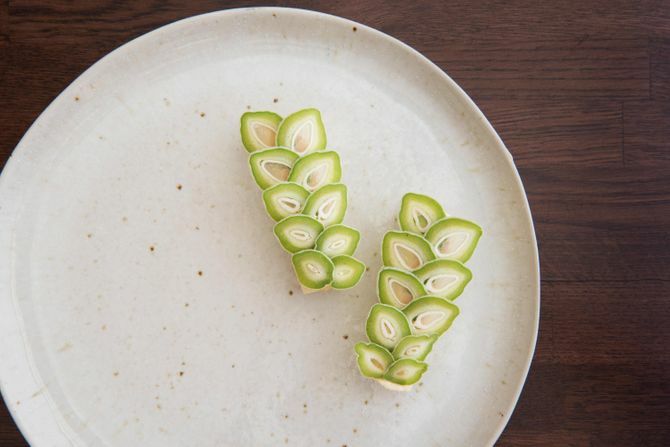 Green almonds aren't available for long each spring, but chef Elise Kornack uses this dish to display their natural eye-appeal and subtle, almost grapelike flavor. 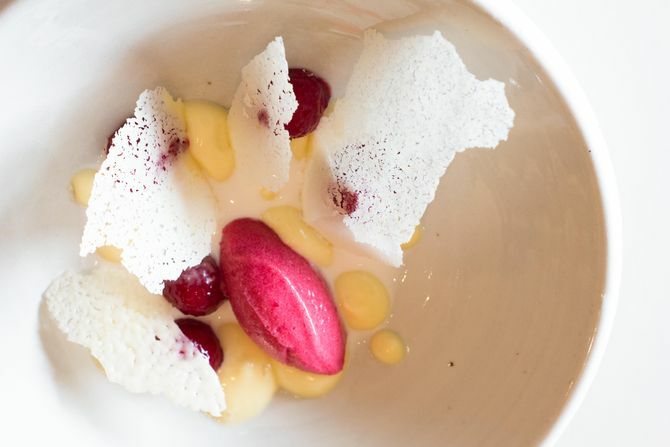 With a studied but seamless movement through the seasons, Alex and Kevin Pemoulie devised this dessert as an homage to late winter. 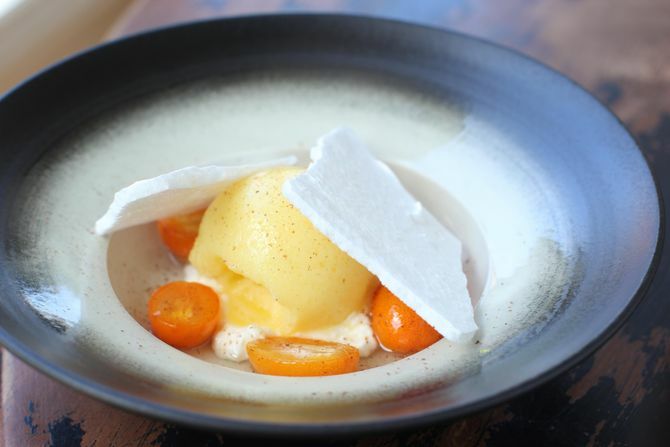 Orange sorbet is teamed with Cloumage cheese curd from Shy Brothers farm in Massachusetts, and layered with citrus meringue and candied kumquats. 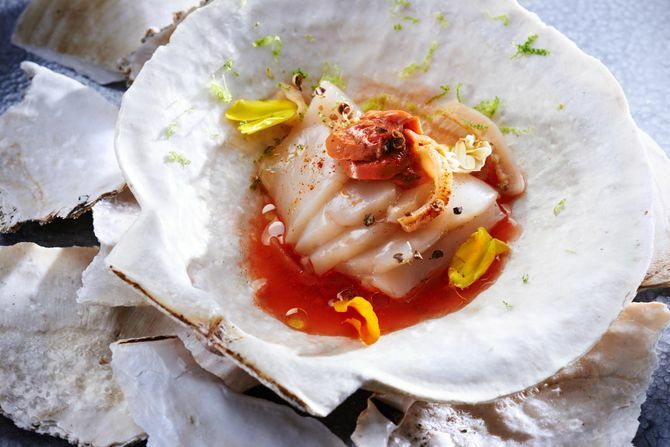 Although Jonathon Sawyer's nine-month-old Trentina is ostensibly devoted to the cooking of Northern Italy, Sawyer and his staff tend to take the inspiration as more of a jumping-off point, forgoing classics in favor of producing dishes like this combination of sliced scallop served in its shell with carrot vinegar, and oak-smoked roe. 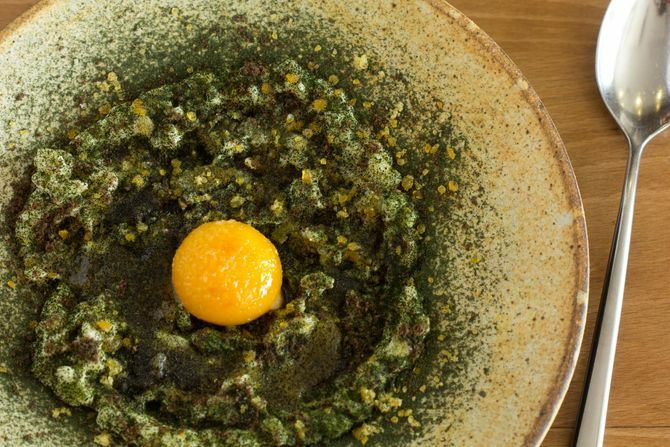 In an example of the way Ludo Lefebvre's kitchen makes the familiar fanciful, this dish of brown-buttered rice pudding dusted with wakame is topped with a sugar-syrup-brined egg. Bruleed with a blowtorch, the yolk bleeds into the pudding once a diner jostles it. Beloved for its elaborate caviar program and synchronized service, meals at Tru veer into performance art. 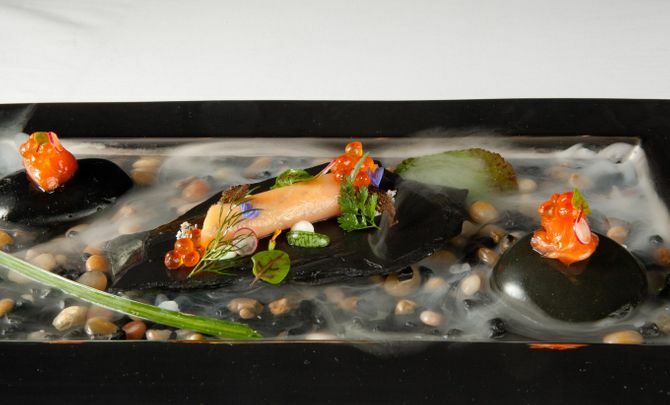 Chef Anthony Martin’s dishes are stylized dreams, and this one, meant to reflect a salmon stream at dawn, comes to life. 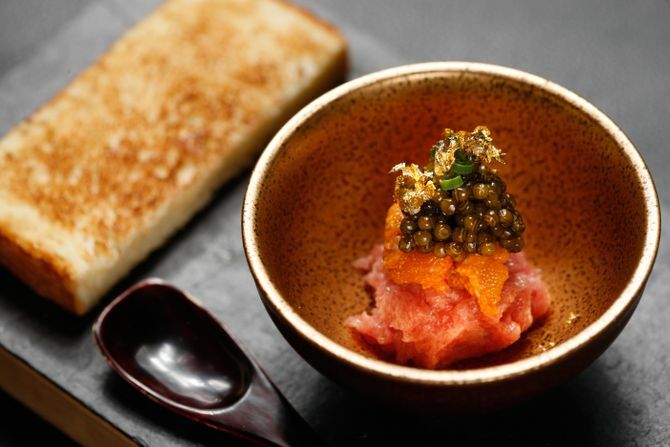 For it, salmon belly is cured for ten hours and finished with keta salmon roe. Chef Tyson Cole spent months experimenting with curing and smoking yellowtail tuna until landing on a winner: first a half-and-half sugar and salt cure with anise and coriander, then an applewood cold smoke. The dish has been a long-time standard on his menu, picking up the nickname “Japanese nachos” over the years. Chef Chris Shepherd has one rule: Never say no to a farmer. So when he gets a bulk of carrots, he will figure out what to do with them. These days, he pickles, blanches, shaves, and purees them. But by tomorrow, he may roast them in a coffee rub or burn them to a marshmallow-like pulp. No matter what, his fun-loving, “T’hell with it” style always ends up in a pretty plate. Pen shell clam was embargoed for four years so chef Ken Oringer was inclined to celebrate its return to market in grand style. 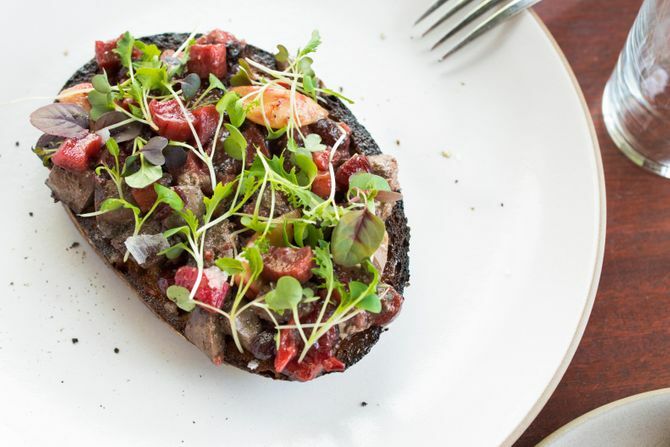 With housemade beef-heart pastrami, uni, and smoked fava beans, the dish adheres to Oringer’s modus operandi: using time-honored Japanese ingredients but steering them away from the traditional with unconventional pairings. Justin Smillie still makes some of the best pasta in Manhattan, but at Upland, he’s moved away from rustic Italian cuisine and embraced a more artful modern-California-style approach to cooking. 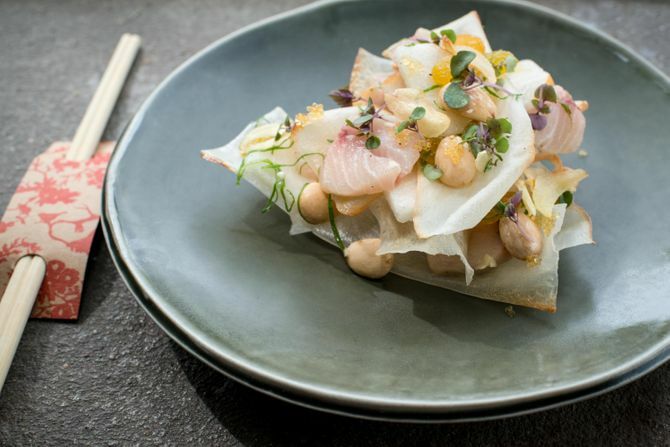 He recently added this dish to his menu, and it shows that he highlight a single ingredient in a dish that looks, and tastes, extremely complex. 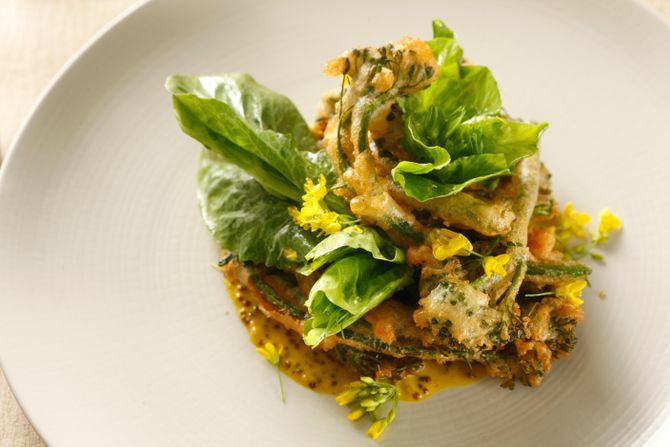 Like Dirt Candy in New York, Vedge celebrates vegetables, but doesn’t necessarily treat them as sacred and virtuous. The dishes are innovative, and even a bit kooky — making ingredients like mushrooms and tofu and carrots seem rich and luxurious. 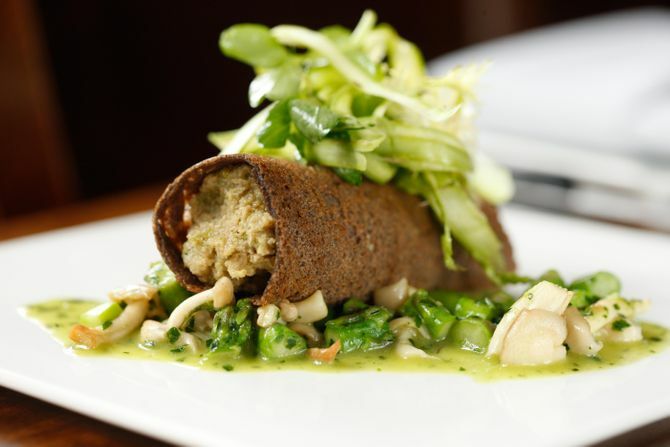 Here, a buckwheat crepe gets stuffed with a filling of asparagus and roasted cauliflower, before being served with roasted asparagus tips, honshimeji mushrooms, and tarragon butter. Many consider Marc Vetri to be one of America's foremost Italian chefs. There's a reason why, as he's able to pare down dishes to their purest, most perfect forms. 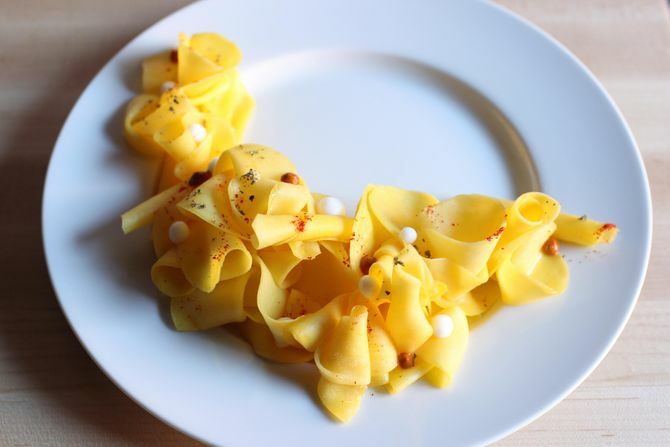 Take, for example, this stuffed pasta, which requires no other flourishes or high-falutin garnishes to look completely elegant. 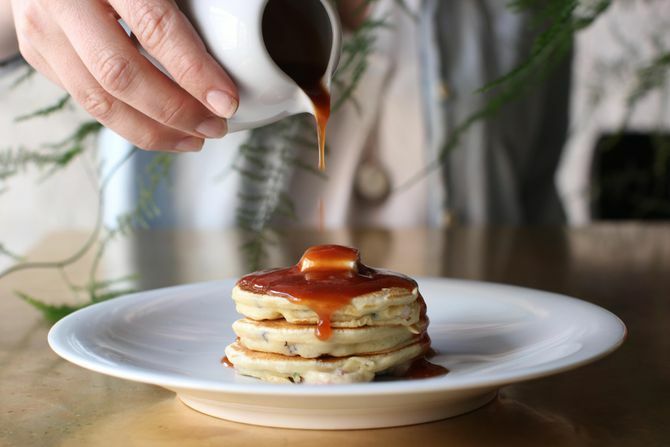 At his ambitious tasting room, chef Jose Garces builds entire dishes around themes (one savory dish, Milk & Cereal, was inspired by a glass milk container Garces discovered at the MoMA store). 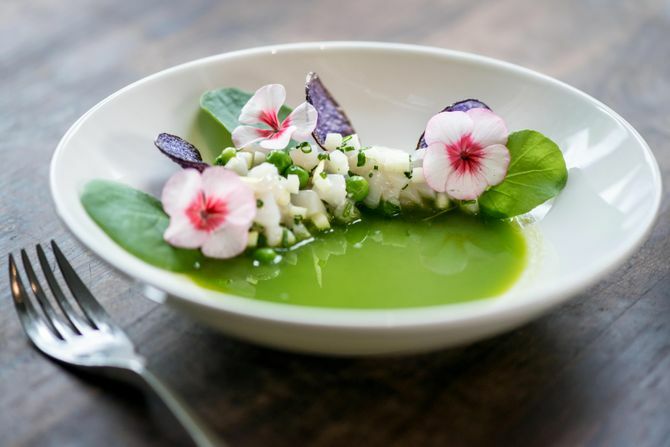 For this presentation, Garces and his team look to the coast of Ecuador, combining textbook ceviche with modernist twists like tomato gelée and popped sorghum, along with delicate cilantro flowers. 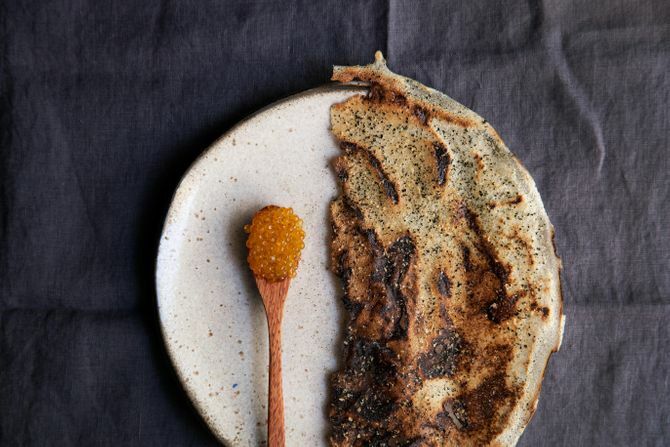 Dinner in Blaine Wetzel's secluded restaurant is all about appreciating the area's natural bounty in its purest form, which is why a meal might include a course of something as simple as leaves of swamp grass meant to be dipped in a puree of mustard greens — or this brilliantly stark duo of a crispy crepe and fresh roe. 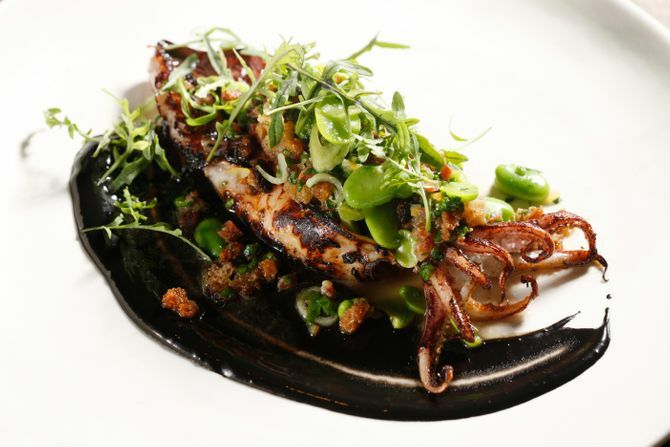 Michael Solomonov's Zahav is best known for its next-level hummus, but the restaurant has plenty of other tricks: This dish, for example, is a master class in how to make simple, raw seafood colorful and texturally interesting, without disrupting the gentle integrity of the fish.